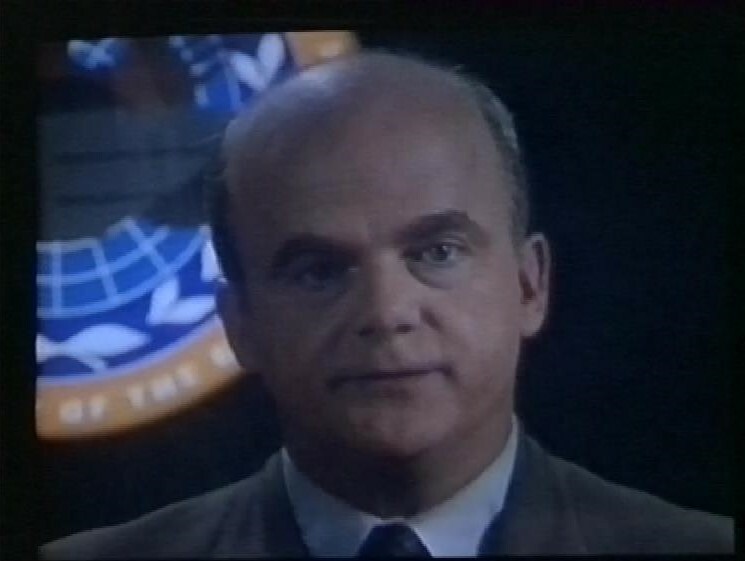 Four episodes from Babylon 5 are on today’s tape. First, an episode from season one, TKO. An old friend of Garibaldi’s Walker Smith, comes to the station. He’s a former boxer, once a champion, but who left when he was being pressured to throw a fight, and he’s on the station looking for one last chance to recapture greatness. I have to admit, this story does nothing for me, as I don’t like boxing or fighting of any kind. 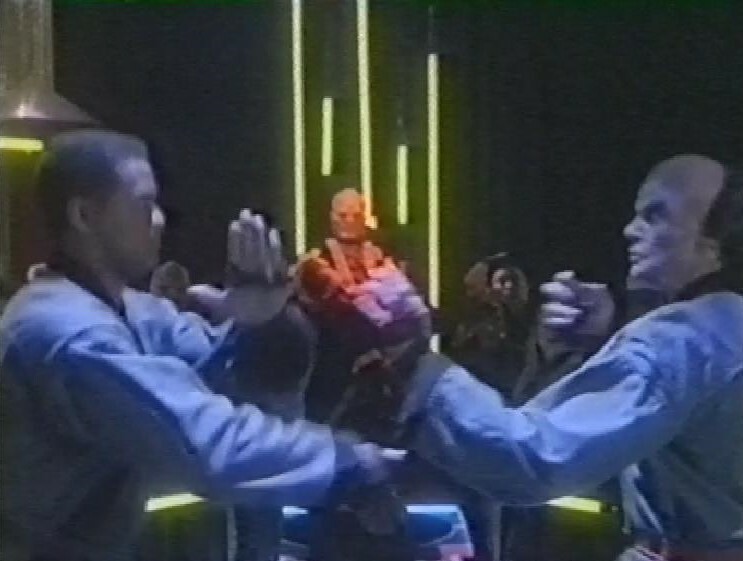 Here, it’s a kind of Alien Mixed Martial Arts that’s supposedly too dangerous for humans to compete in, but Walker is determined, and, while he doesn’t actually win his fight, he does fight his opponent to a standstill, thus proving the humans are up to it, and being the hero he wanted to be. The other story here is about Ivanova. An old family friend, a Rabbi, has arrived to help her sit Shiva for her dead father, but she’s angry at her father for not providing the love and support she needed when her mother died and refuses. But if course, she changes her mind and gets to cry a bit at the end of the episode. 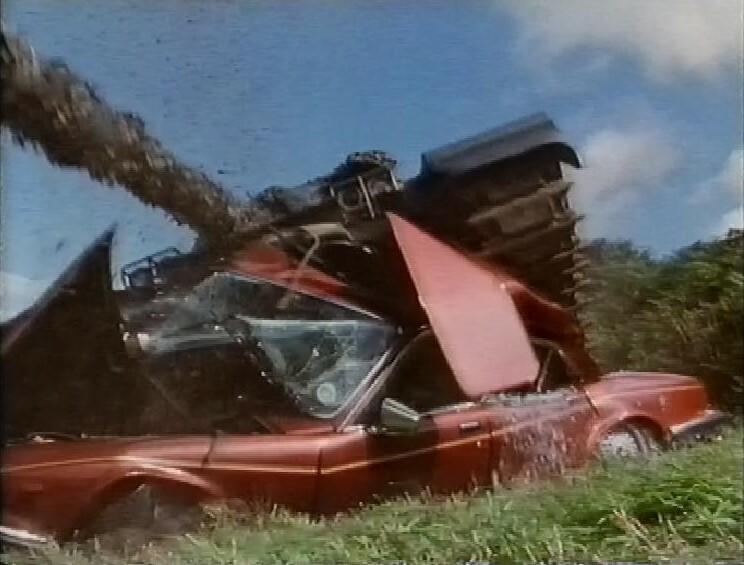 This episode, if my memory isn’t failing me, was not shown in Channel 4’s original tea-time run of the show – or perhaps it was shown in a very edited form – and this repeat came shortly before the start of the second series, later in the evening. And so we get Points of Departure. The first episode of season two, and lots of threads have to be tidied up. Garibaldi is close to death, after being shot in the back by his aide (who never gets a name in the credits, he’s always ‘Garibaldi’s Aide’). Delenn is in a cocoon in her quarters. 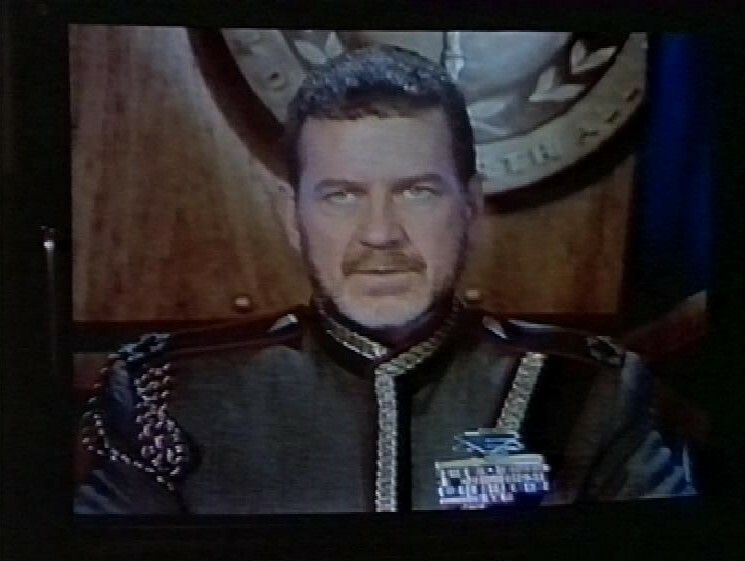 President Santiago was killed when his ship exploded. 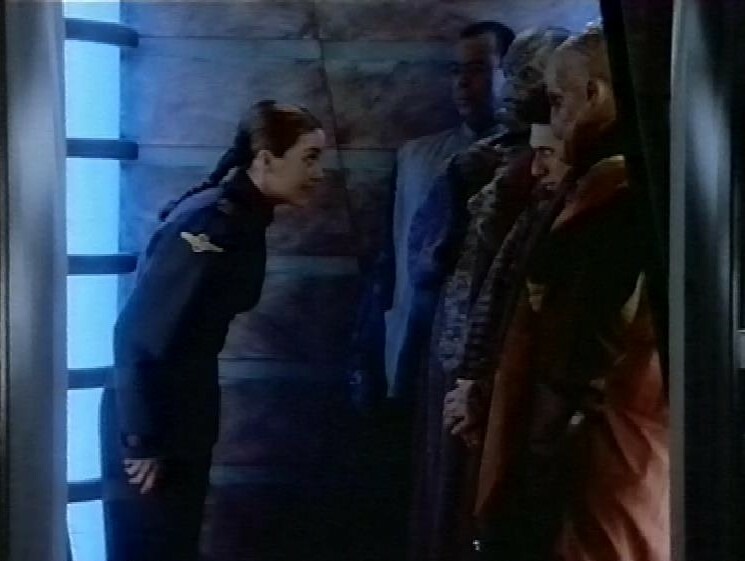 And Ivanova is trying to keep order on the station after Commander Sinclair was suddenly recalled to Earthdome. 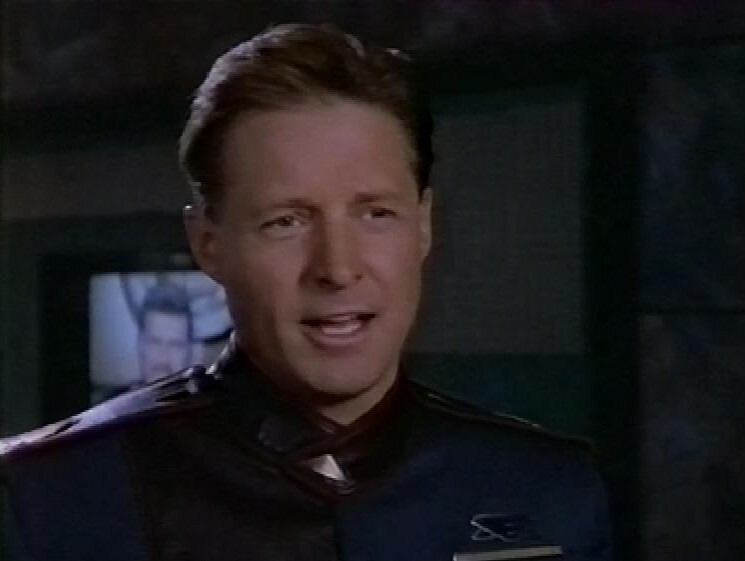 The episode opens in the battleship Agamemnon, and we meet our new leading man, Captain John Sheridan, played by Bruce Boxleitner. 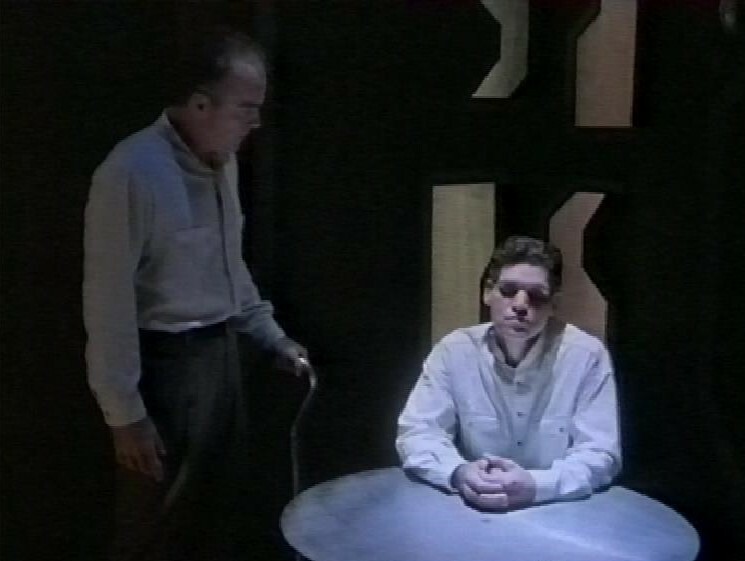 He gets a message from General Hague (Robert Foxworth) warning him about a renegade Minbari ship that has been spotted recently, and they are worried it might still be going to attack Earth outposts. He also tells him he has a new assignment. Interesting note about credits sequences. 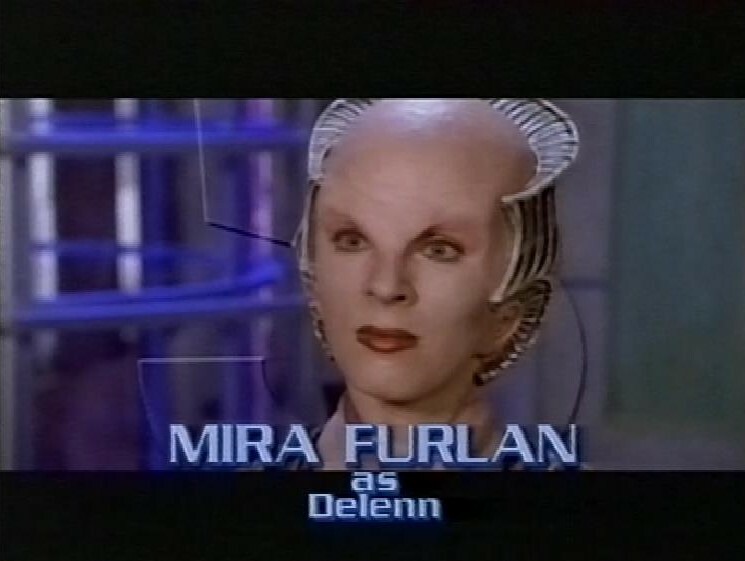 A few days ago, someone on Twitter asked Joe Straczynski about the title sequences, and someone complained that the titles to the first episodes of Season Two were spoilers because they showed Mira Furlan (playing Delenn) as she looks after she comes out of the cocoon, and that’s quite a big spoiler. 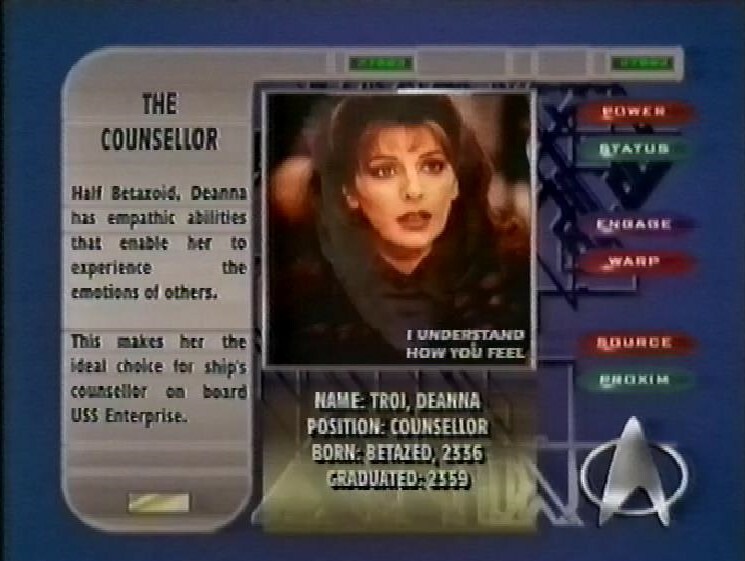 But another user said that this was a mistake on remastered version of the early episodes, and on the original broadcast run, her picture in the titles was a pre-cocoon Delenn, He’s absolutely right, here’s the image from the titles of this episode. The first two episodes had this, and the third episode, after we’ve seen her emerge from the cocoon, is of her after the makeover. Another note about the credits. 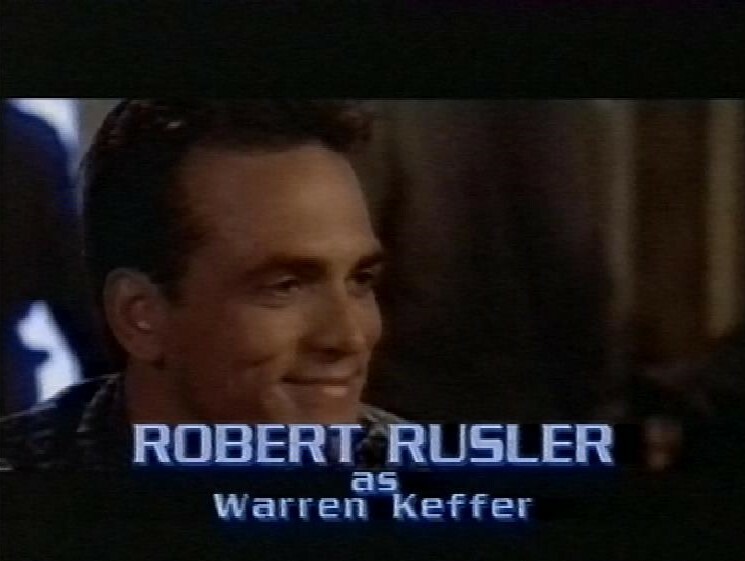 There’s a new character in the opening credits, Robert Rusler as Warren Keffer. 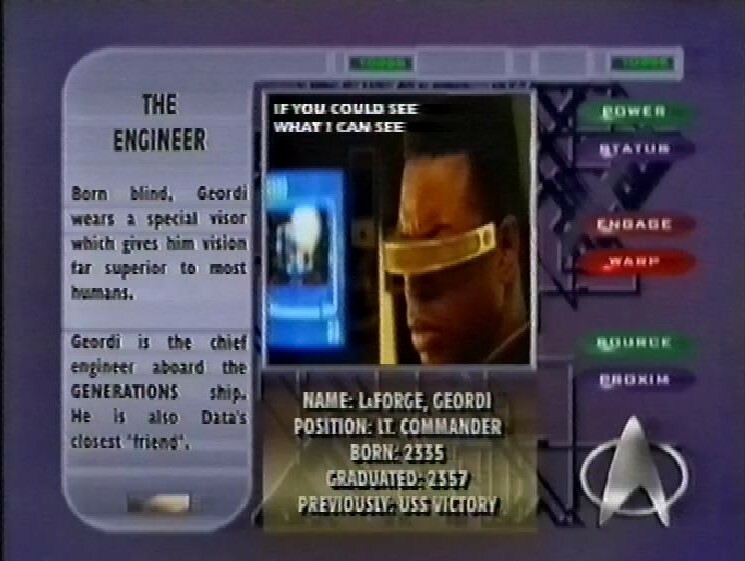 He’s a starfury pilot we meet in this episode, and he’s oddly familiar with the command crew at the end of the episode in a way none of the other regular pilots are. 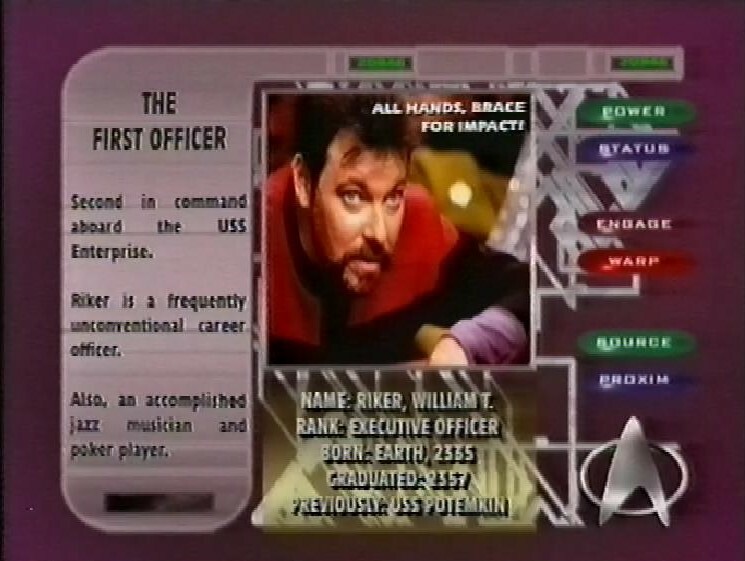 This is never remarked upon in the story, he’s just suddenly there, apparently an important character (indicated by his name in the credits) but he doesn’t get to do much in this episode except fly out to face the renegade Mibari ship, and then not fire any weapons. 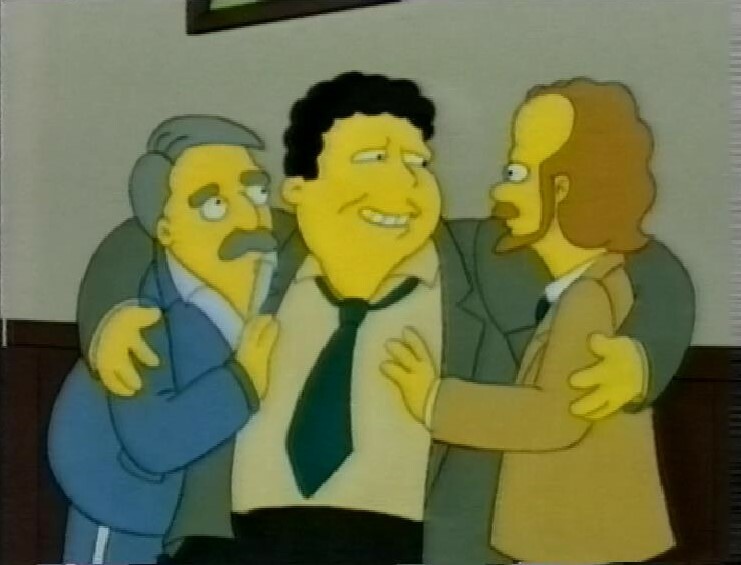 The cynic in me thinks that his presence in the credits is the show deliberately to make it seem more shocking when this regular character dies. They did a similar thing on Buffy The Vampire Slayer, where there was a character in the first couple of episodes who was part of the main gang, who dies within the first two episodes, and establishes the show as one that is prepared to kill anyone. It feels a bit sneaky, but I can’t blame the show for trying to play with the audience’s expectations about characters. 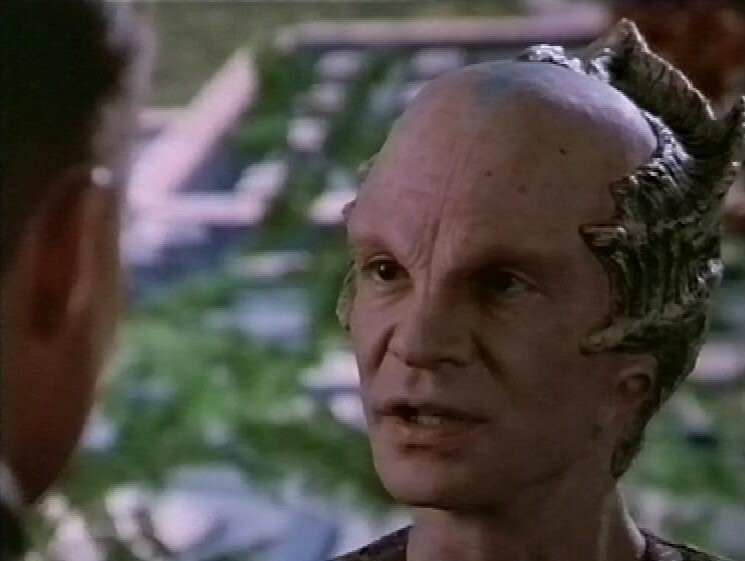 Also in this episode is Robin Sachs, playing a Minbari. 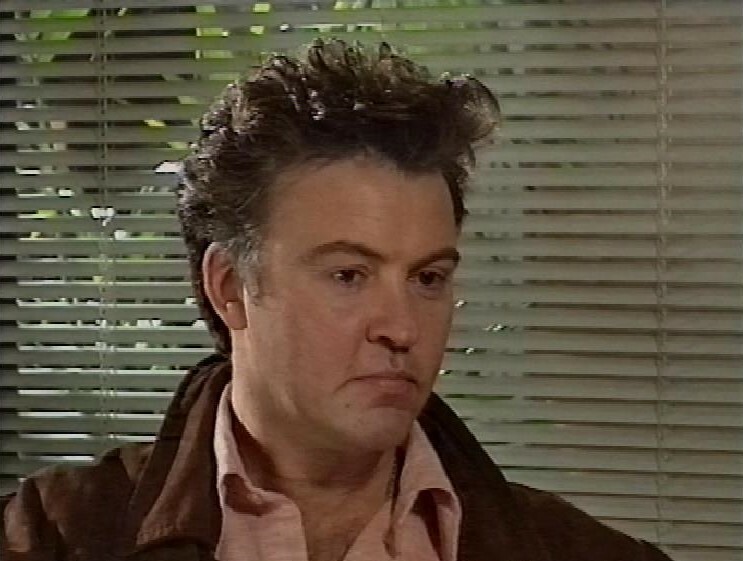 Talking of Buffy as we were, he plays Giles’ nemesis Ethan Raine on that show. 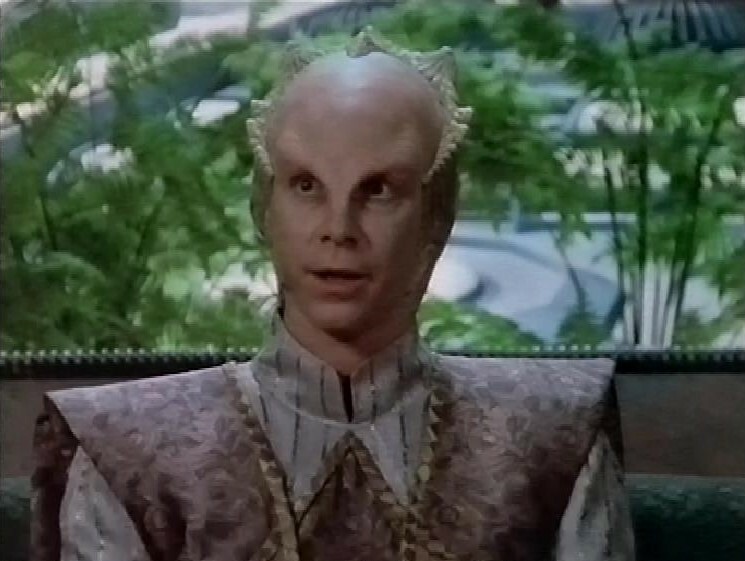 There’s some important information in this episode, delivered by Delenn’s assistant Lennier (Bill Mumy). 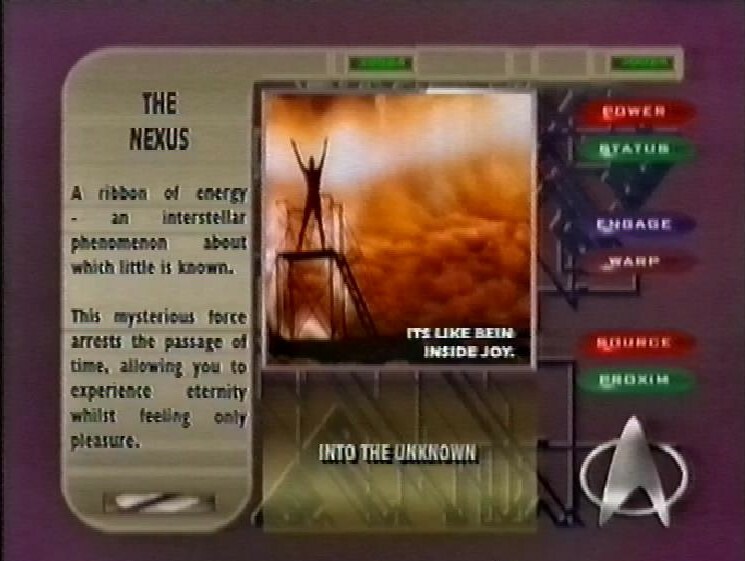 He explains why the Minbari surrendered at the end of the war, when they were poised to destroy Earth entirely. 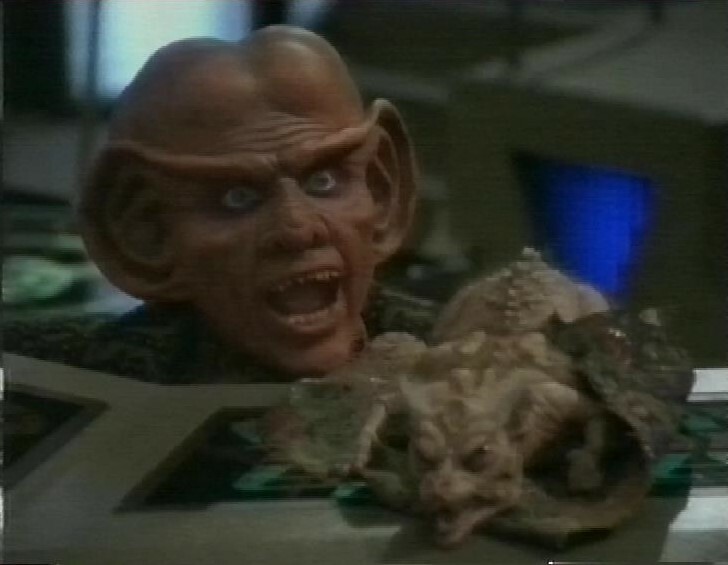 It’s because they discovered that some humans actually possessed Minbari souls. 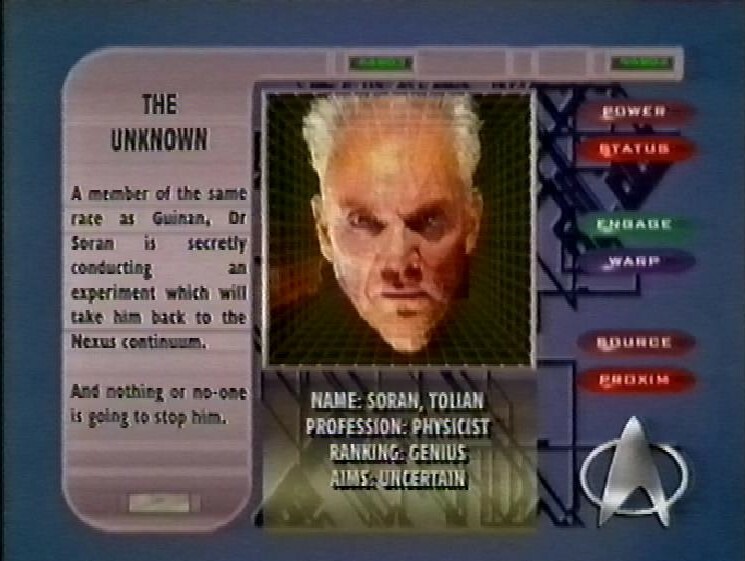 The first person they tested was Commander Sinclair, which explains part of his backstory, as he was taken aboard a Minbari ship during the Battle of the Line, and couldn’t remember what happened. 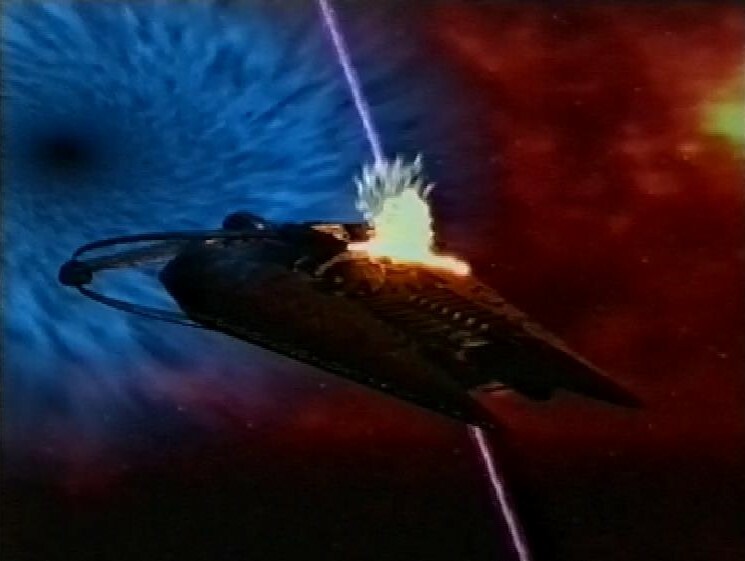 Minbari don’t kill other Minbari, so they surrendered to stop the fighting. 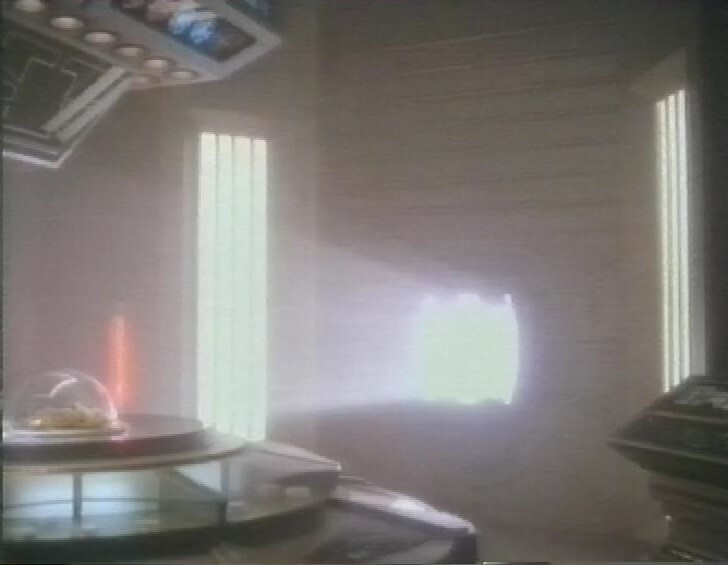 The next episode is Revelations, and is more of an ‘arc-heavy’ episode, meaning it contained plot threads from the story arc that runs throughout the show. 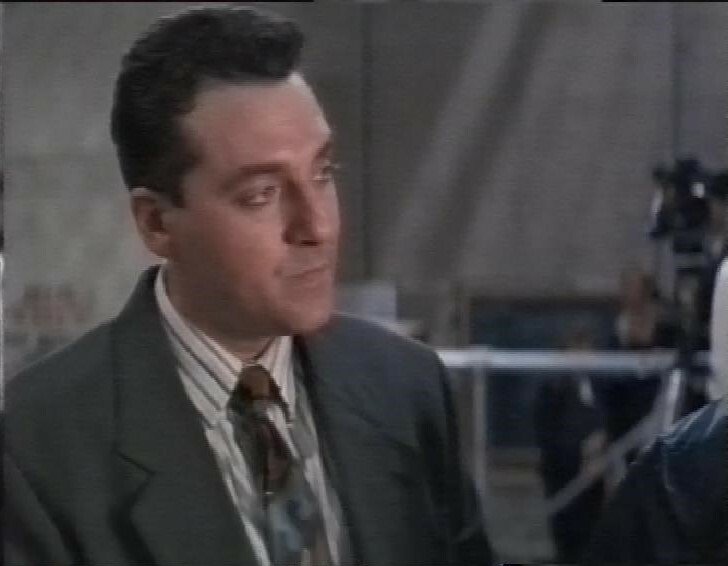 We see the mysterious Mr Morden, played by Ed Wasser, catching up with Londo. “Why don’t you eliminate the entire Narn homeworld while you’re at it” jokes Londo. “One thing at a time, Ambassador” replies Morden. Creepy in the moment, but even creepier when you know how the story pans out. Also in this episode, we learn a bit about Sheridan’s tragic back story, because his sister is visiting him. 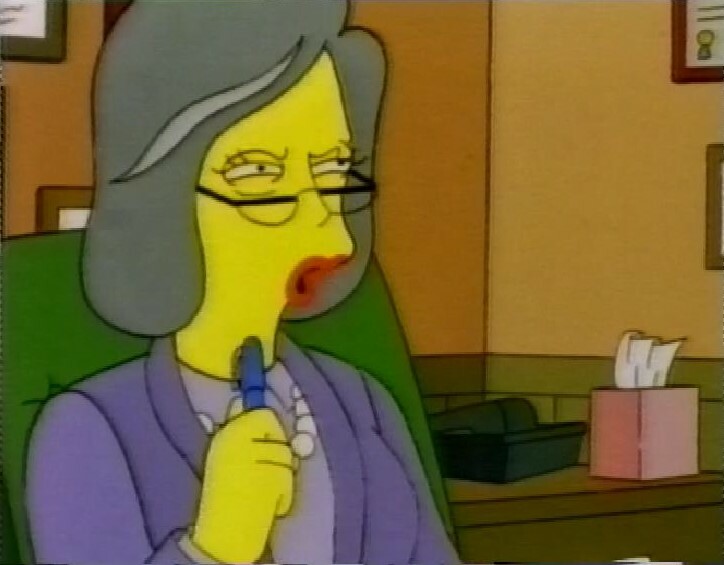 She’s played by Beverly Leech, and I can’t remember if we ever see her again. Sheridan’s story is that his wife Anna left on an archaeological trip, and never returned. Sheridan is still guilty that he never properly said goodbye to her. 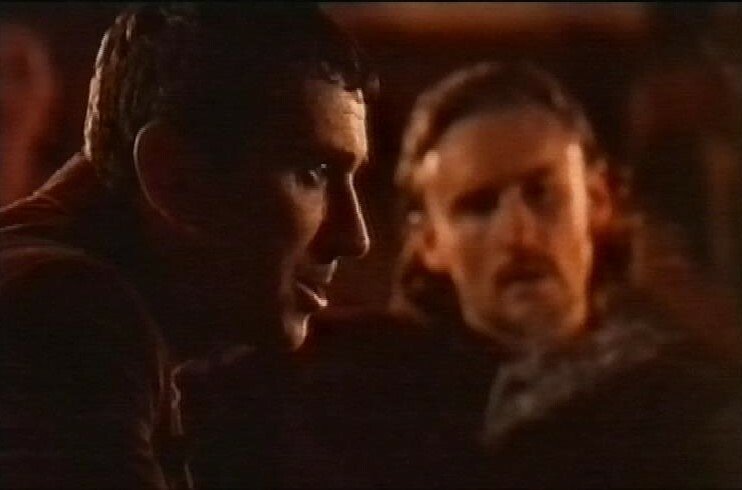 Garibaldi recovers from his injuries, after Doctor Franklin uses the magic machine from Season One to cure him. And he uses the telepath Talia Winters to help him remember what happened when he was shot, allowing him to remember that it was his aide who shot him. We get a rare glimpse of the new President Clark, who’s strangely interested in whether Garibaldi’s aide knew anything about the alleged conspiracy to murder his predecessor. G’Kar is convinced there’s something strange going on on the Rim, on Za’ha’Dum, which was the homeworld of an ancient race. But the expedition he sends there is destroyed – by shadow ships. 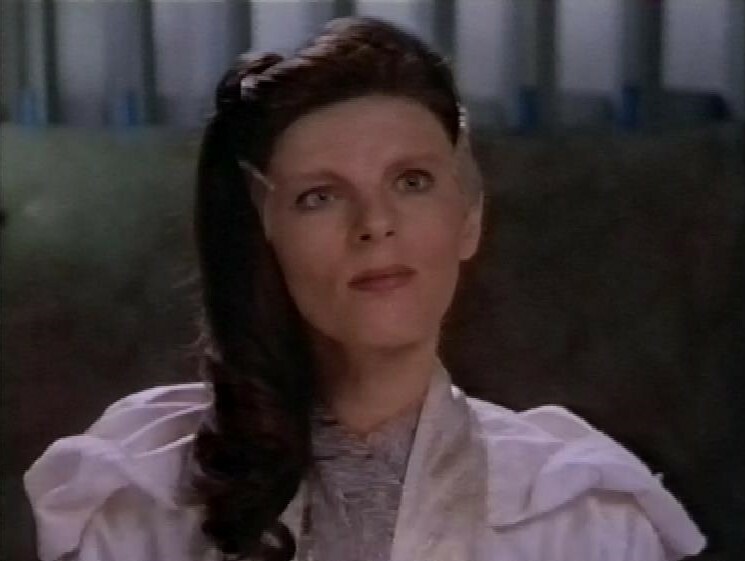 And as if that wasn’t enough incident, Ambassador Delenn emerges from her cocoon looking a lot different to how she looked when she went in. 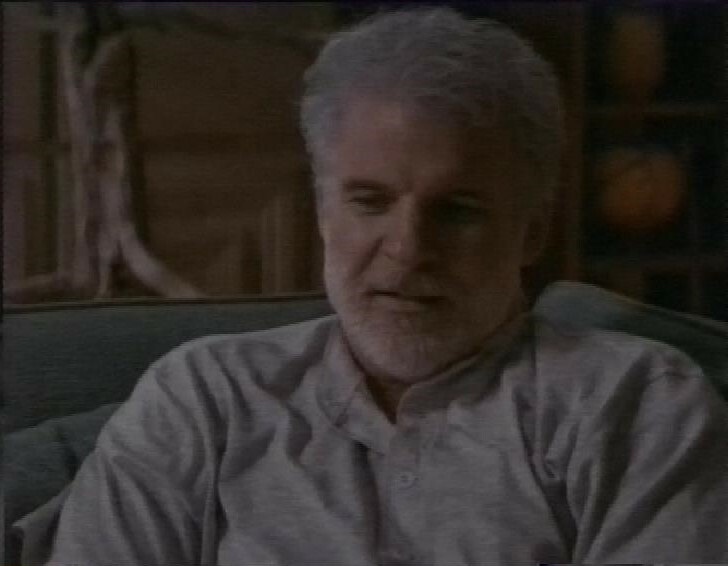 The episode ends with Sheridan seeing a message sent by his wife to his sister before she left, telling her that she’s so excited about the expedition, and so happy that Sheridan had his own mission to occupy him, so everything had worked out perfectly. She obviously didn’t have any worries, and he’d been worrying needlessly. 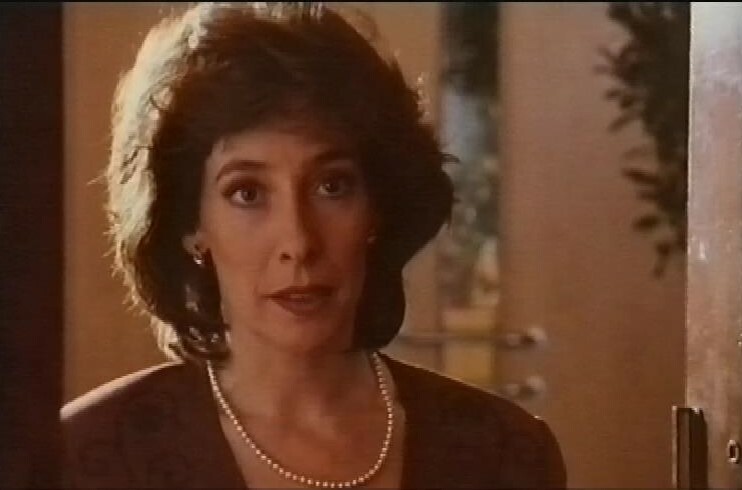 In this scene, Anna is played by Beth Toussaint (with enormous hair) and was the only time she played the part. The next episode is The Geometry of Shadows. Londo is excited when a group of Technomages arrive on the station. He thinks that getting the endorsement of one of them will help his standing back on Centauri Prime. 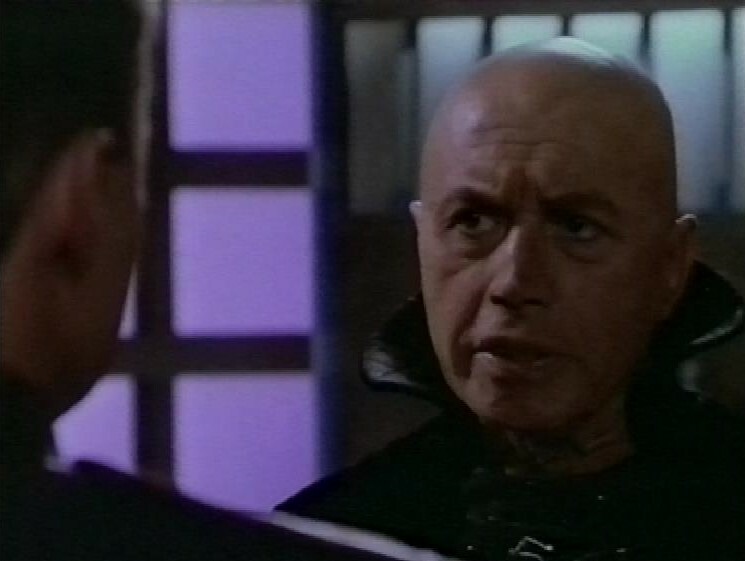 The leader is Elric, played by Michael Ansara. Londo sends Vir to ask for their blessing. He’s menaced by an slightly unconvincing monster. 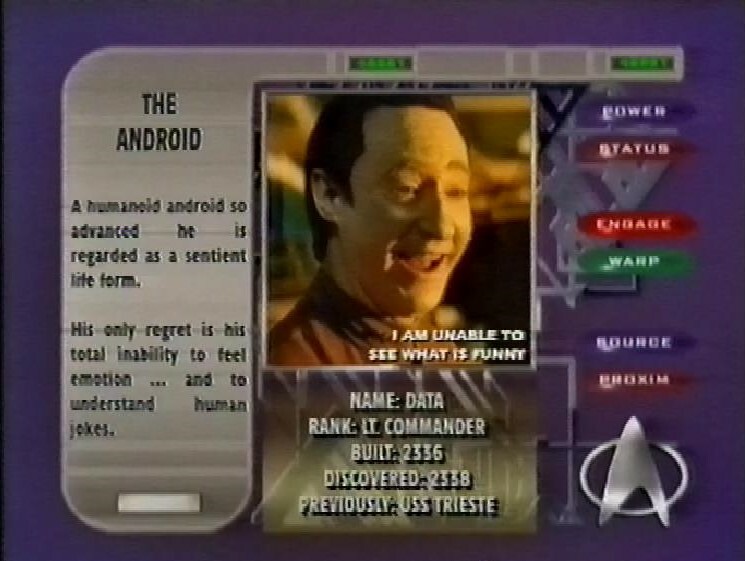 B5 was great at spaceships, not so good at creatures, but that was the state of the art in 1995. 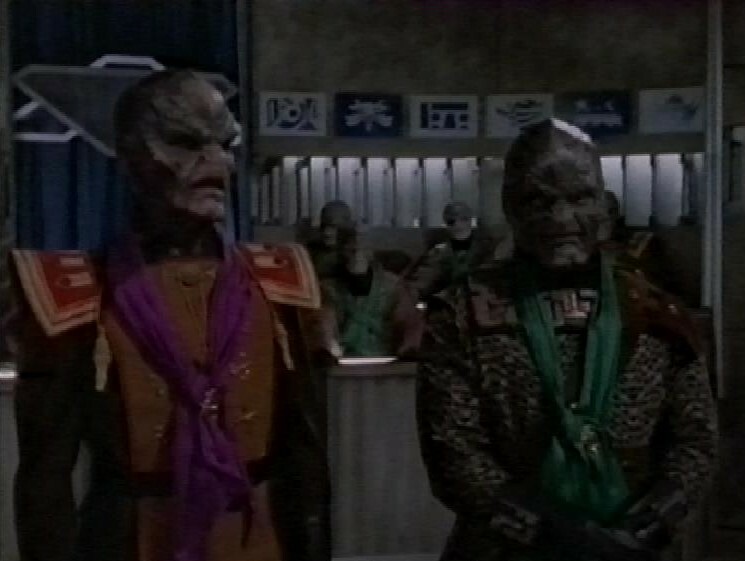 The B-plot concerns Ivanova trying to handle the Drazi on the station, who have split into two arbitrary factions based on green or purple scarves, and who have to beat each other up until one side wins. It seems like a rather stupid tradition to have grown up, but the Drazi tend to be portrayed as stupider than the other alien races, so maybe it makes sense. But I’m with Ivanova and her frustration with the whole situation. This is a fun episode, with a bit of foreshadowing from Elric when he tells Londo what he has seen in his future. It isn’t good. After this, the recording continues with a short programme featuring three poems about science, complete with a dedicated ident, for Rhyme and Reason week. Then, Channel 4 News, leading with more political manoeuvring in Northern Ireland. The other story covered in this fragment is Arsenal sacking their manager George Graham after allegations he personally profited from player transfer deals. The recording stops during this bulletin. 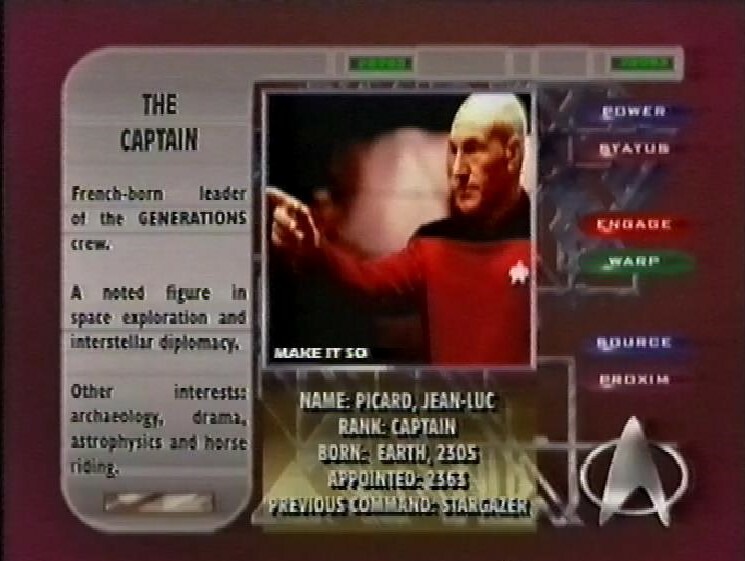 In the ad breaks, there’s one for Star Trek Generations which is something a bit unusual. 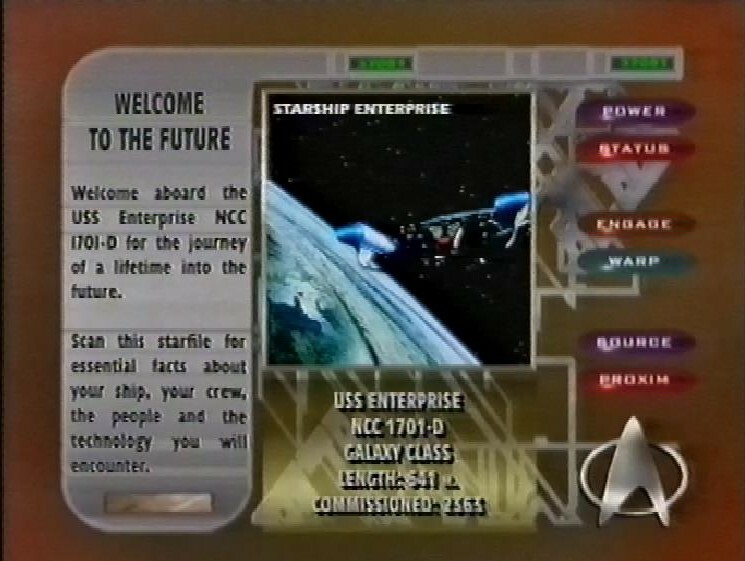 At the start of the ad break, viewers are told to “Set your video to record the rest of this break and prepare to enter a new era in entertainment technology.” At the end of the break, the advert appears, and it has a bunch of information shown in quick succession, designed to be paused and read. The Net used to do the same thing, as did Lee & Herring’s Fist of Fun. First on this tape, the Marx Brothers comedy Horse Feathers. 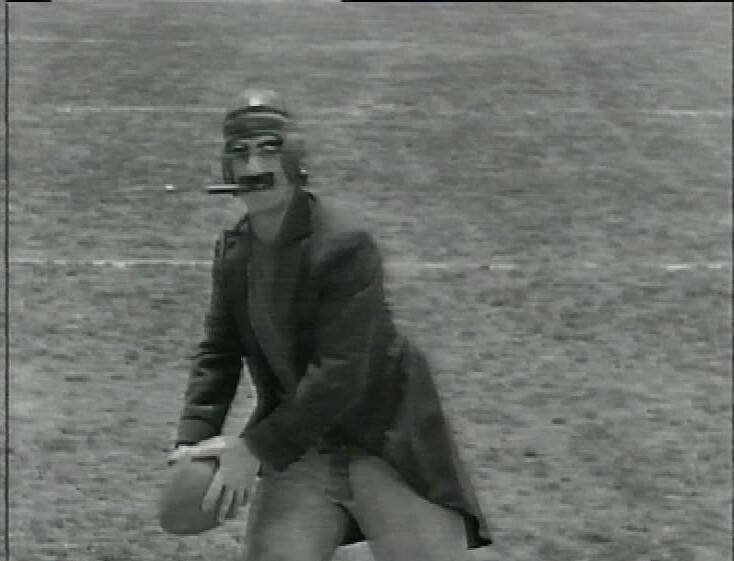 I feel like it’s a personal failing of mine that I don’t love the Marx Brothers. I don’t dislike them, but they just don’t do much for me. It’s the same way for The Three Stooges. 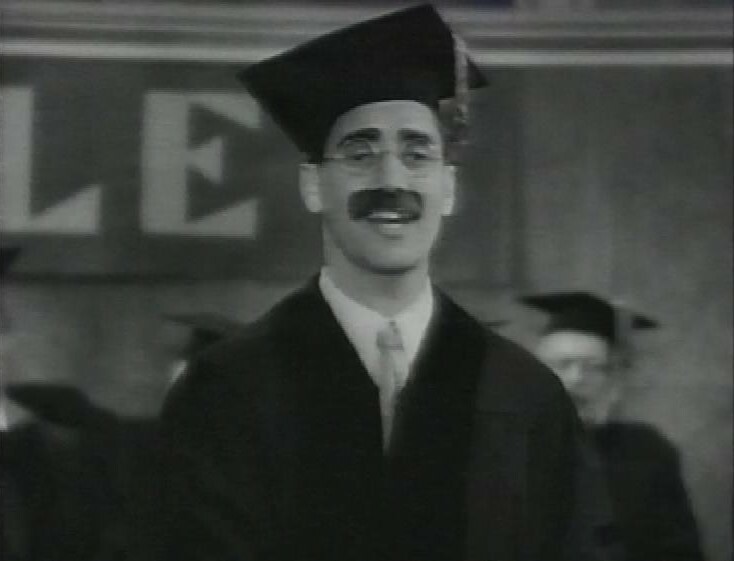 Groucho plays the new dean of a college. 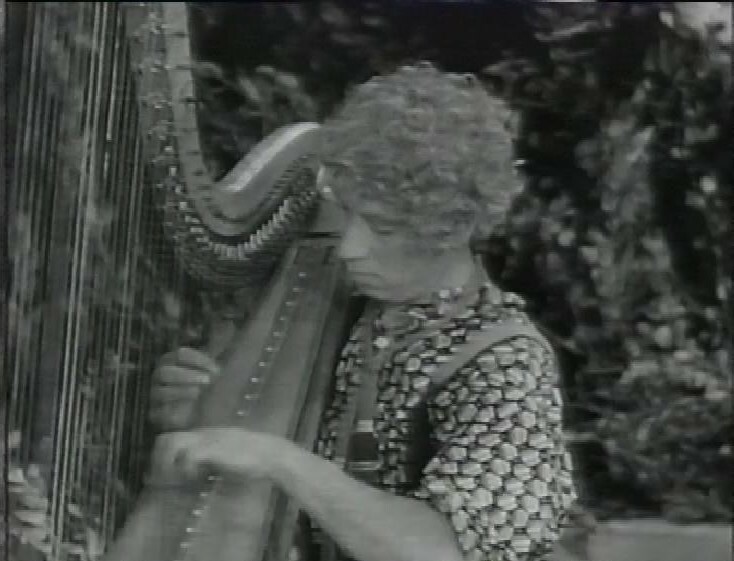 Once again, Harpo plays his harp. The climax takes place at a football match, with plenty of good physical comedy. After this, recording switches to Channel 4 and we have the pilot episode of ER. I went off the boil a bit with ER over the years, but this episode and the next one reminded me where it started, and I can remember why I liked it at the start. What’s surprising, though, is where the characters started. 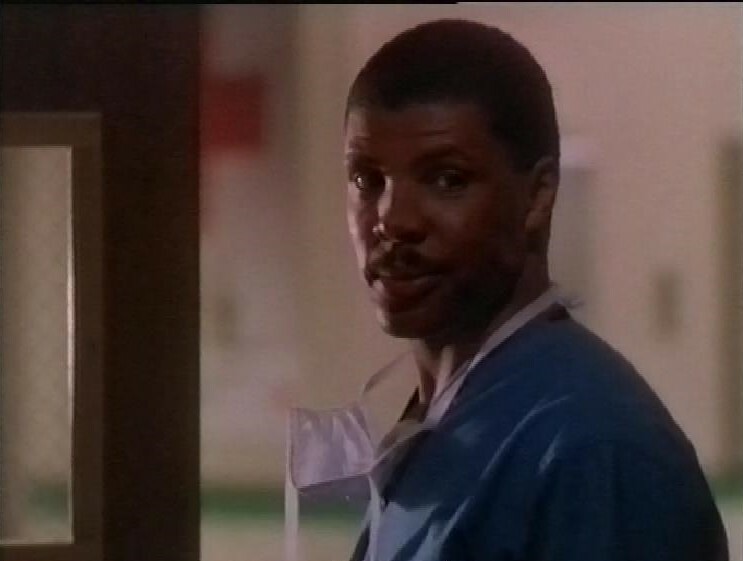 Dr Benton, for example, was always (in my memory) the super competent senior doctor who made young Carter’s life a misery. There’s the beginning of that here, definitely, but there’s also the side of him as still a young doctor, craving the support and praise from senior doctors. He’s a lot more of a junior doctor here. Carter is impossibly young here, and knows absolutely nothing. His main role here is to be the new character, so that the other characters can introduce all the other people on the show without it seeming odd. A lot of medical shows have a character like this, and it always terrifies me to see the new doctors learning on the job, on real people. 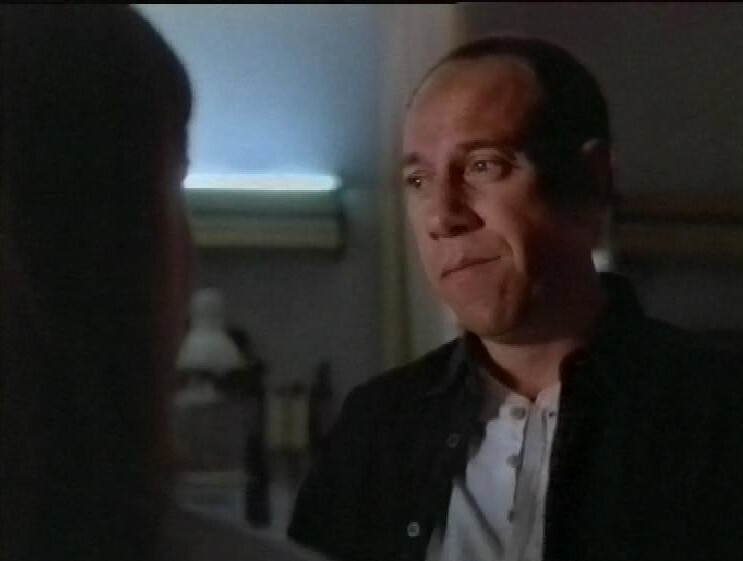 This first episode has a guest appearance from Miguel Ferrer as a man who gets some bad news about his chest X-Ray. 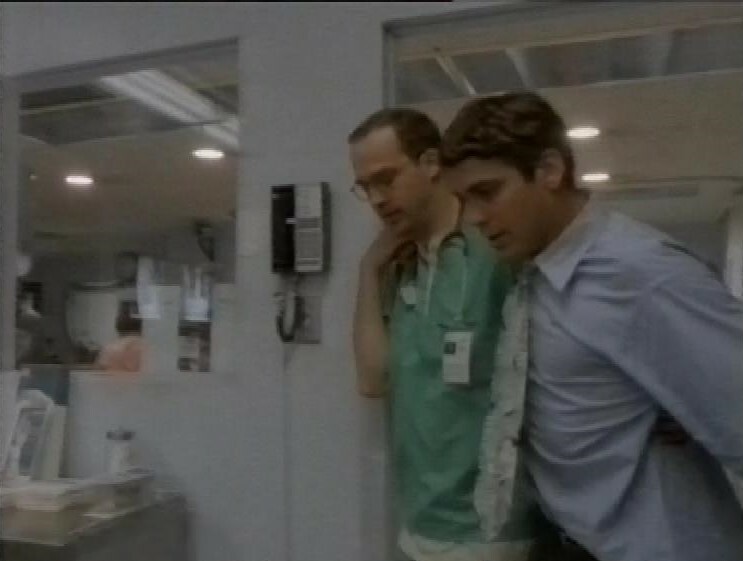 The big shock of the first episode is when Nurse Carol Hathaway is brought in to ER after a suicide attempt. I’d totally forgotten about this, and how it dominated her story for much of the first season. And the show opens with Dr Green having to help a very drunk Dr Ross. 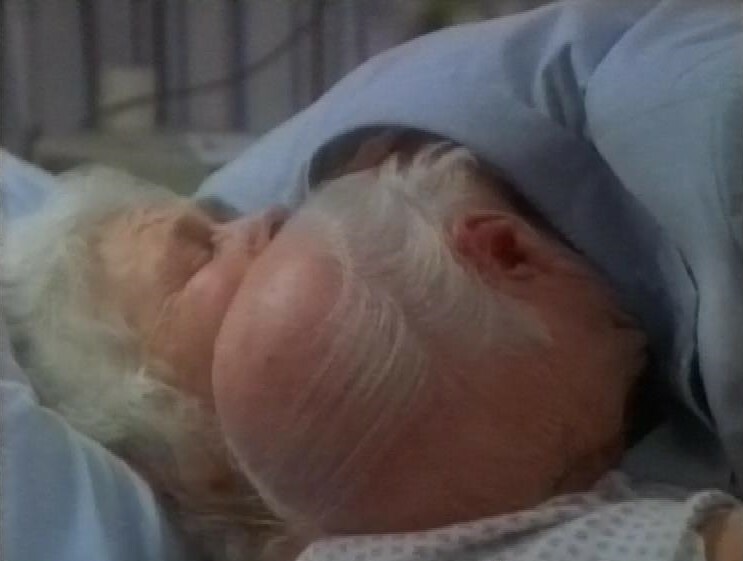 In the next episode, there’s a heartbreaking scene where a dying woman decides not to go on a breathing machine, against the wishes of her husband. Dr Green’s wife passes the Bar exam, but Dr Green has decided not to take a different job in another hospital with far fewer hours, and lots of perks. Their marriage isn’t going to last. And Dr Carter is already having young patients literally throwing themselves at him. 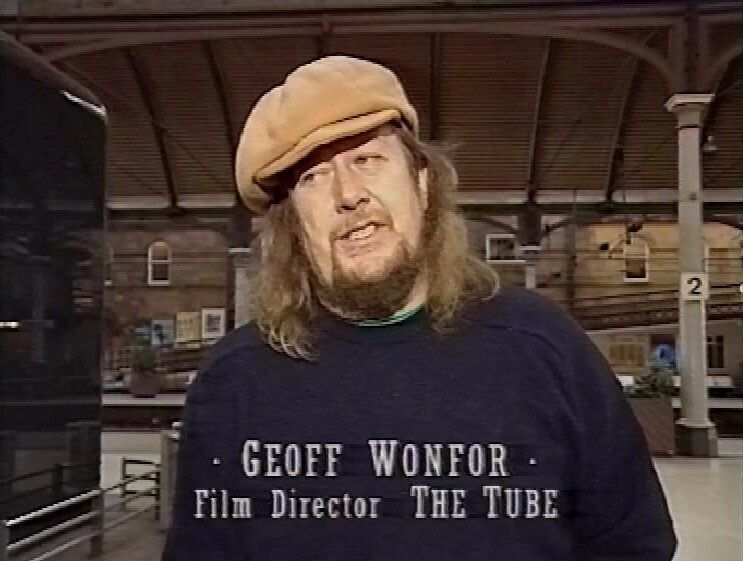 After this, there’s a programme called The Legend of the Tube, which looks back at the history of the programme with Jools Holland, Paula Yates and many other people involved in the show. I still get slightly sad thinking about Paula Yates. Interviewed for this retrospective were Paul Young. 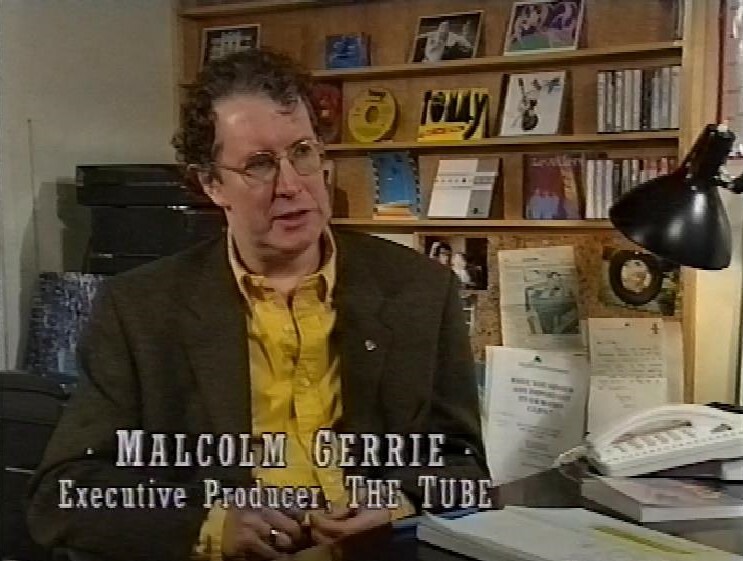 Malcolm Gerrie, the Executive Producer. 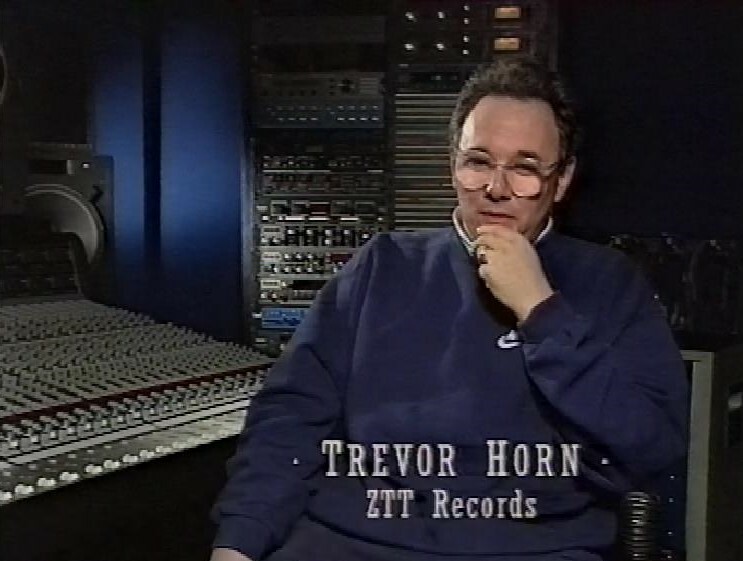 Trevor Horn remembers the fun to be had in the local hotels, with all the bands having travelled up to Newcastle for the recording. He also remembers discovering Frankie Goes To Hollywood when they appeared on the show before they had a record contract. 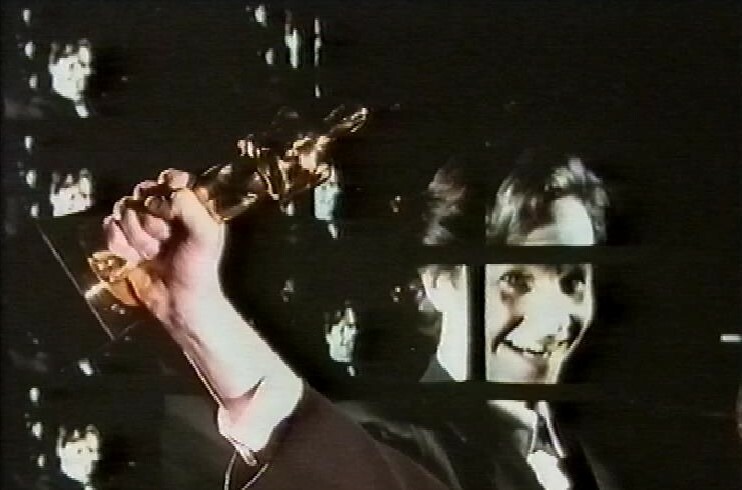 Geoff Wonfor was the film director, responsible for the original Frankie performance of ‘Relax’. 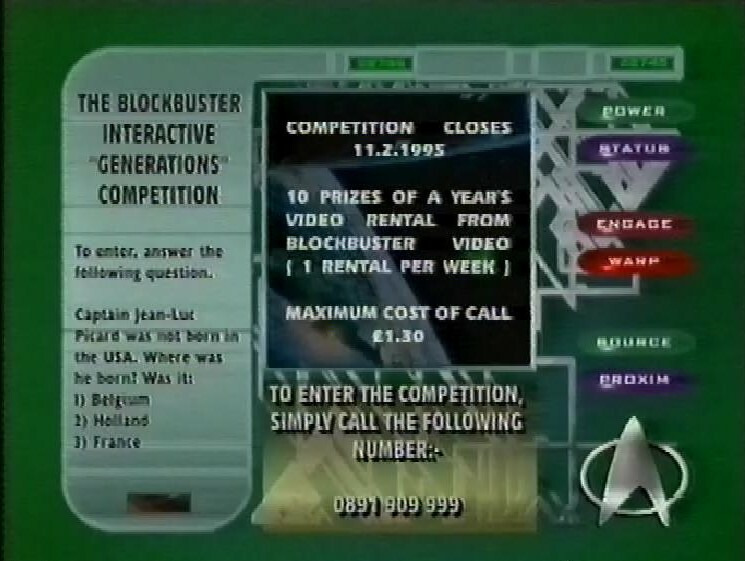 The tape ends just after this programme finishes. 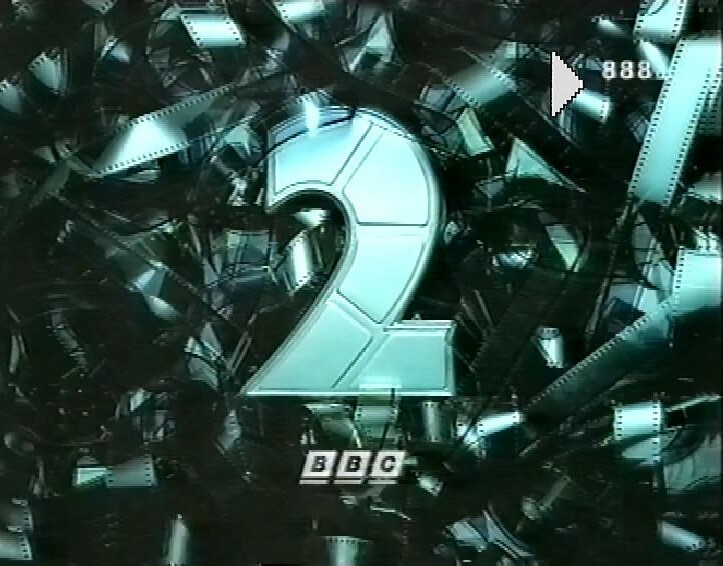 On this tape, I’m guessing there was a movie on this first, as there’s a few frames of the BBC2 Movie ident, which I love. 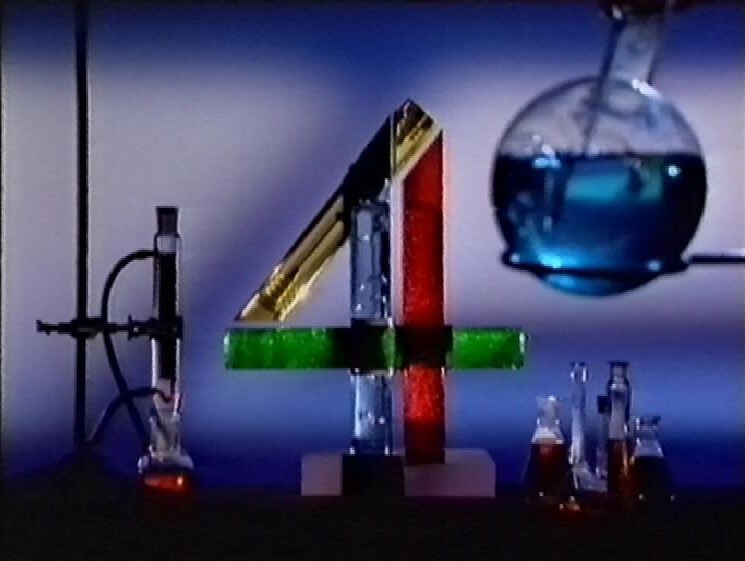 But then we’re off to Channel 4 and the end of an episode of Cutting Edge. 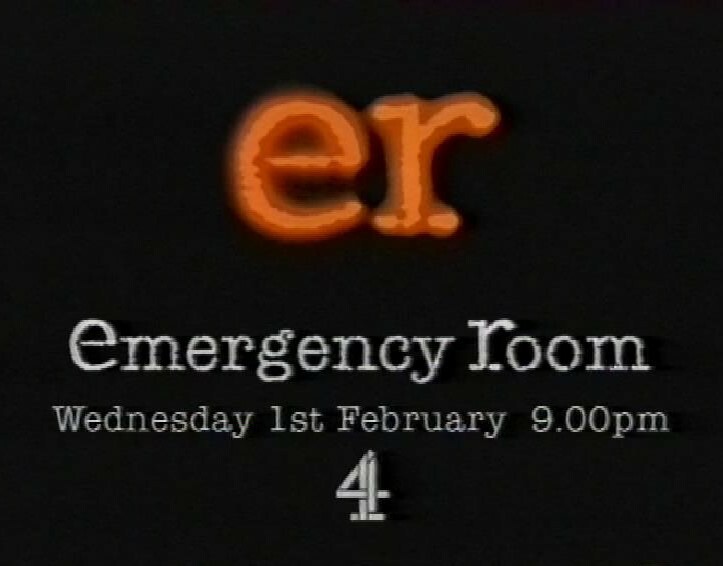 There’s a trailer for the then new ER, which actually calls the show ‘Emergency Room’ complete with clumsy typography. And it’s not just the caption, the voiceover calls it that too. Then we start the second season of NYPD Blue. I usually skip these, but I was doing other stuff, so I let these run in the background, so I spotted a few more things. 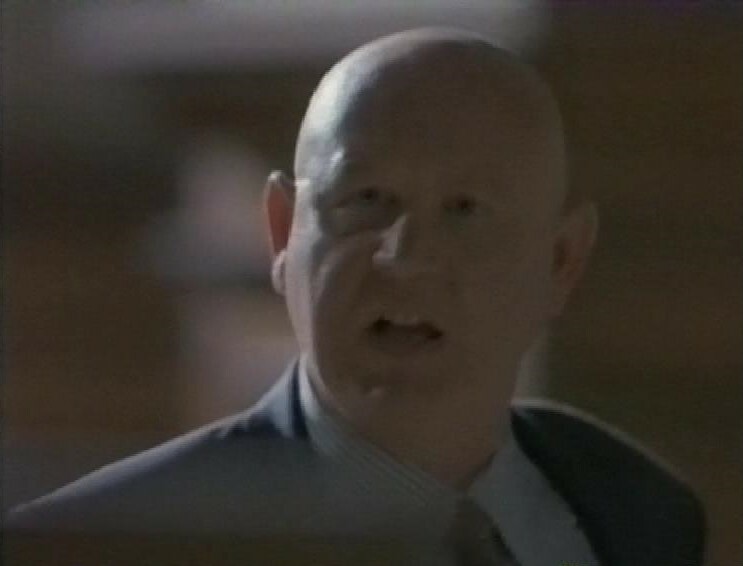 In the first episode, there’s a court case going on involving one of the cops who confessed to having shot some gansters. 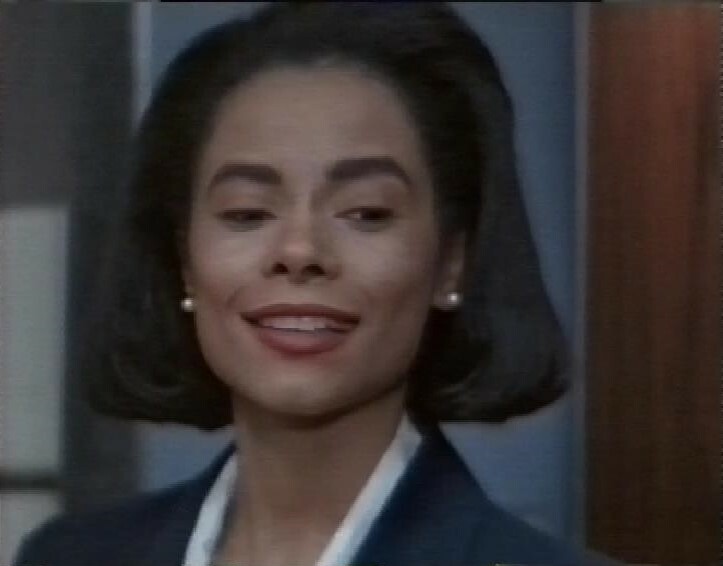 It’s complicated by the fact that she’s also romantically involved with lead David Caruso, so he has to testify, and Internal Affairs are trying to find some dirt on him. This is a thread that runs through all these episodes. 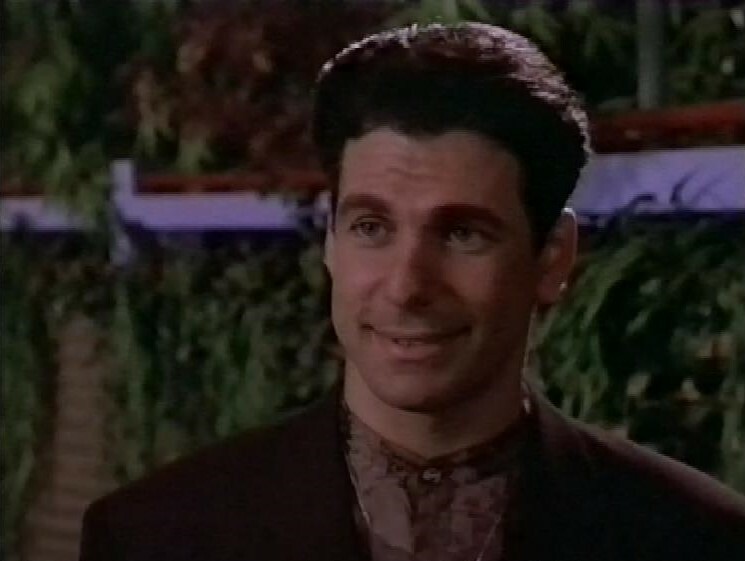 Her defence attorney is played by a pre-Murder One Daniel Benzali. 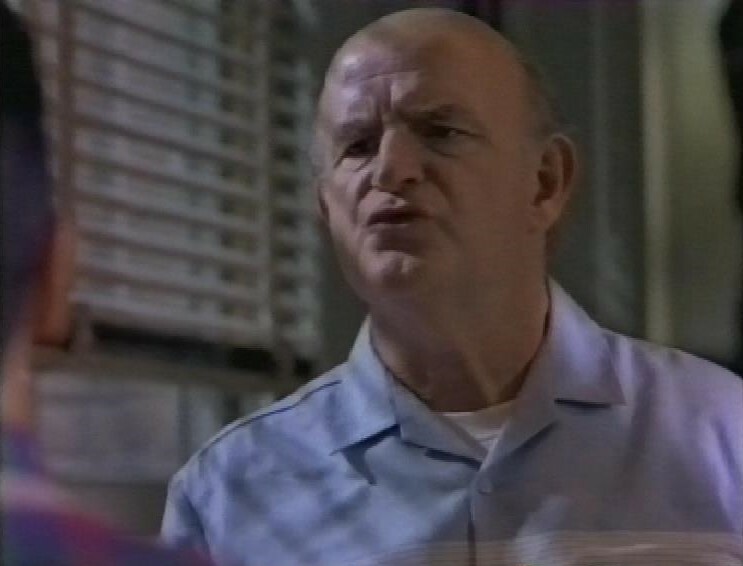 Peter Boyle plays Dennis Franz’s AA advocate. 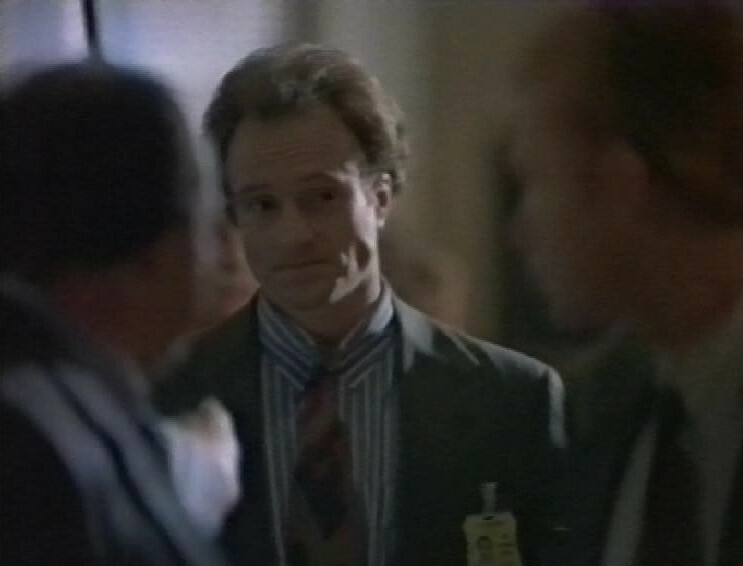 Bradley Whitford plays the sleazy host of a TV Talk Show. In a later episode, Anna Gunn appears, later to be Skylar White in Breaking Bad, and who also appeared with Daniel Benzali in Murder One. There’s four episodes here, and I didn’t hate them, but I didn’t also love them. I still find the relentless shaky camera to be an artless affectation that just annoys me because it is affected. After these episodes (four in all) there’s the start of stand-up comedy, Tommy Davidson Illin’ in Philly. The tape ends after a few minutes. In the adverts, there’s a series of Peugeot 106 adverts that have been all over my tapes, and it’s only just now that I’ve realised that the dark haired woman is Julie Graham, who’s in loads of things these days. There’s an advert for IBM’s ill-fated attempt to release an operating system to compete with Windows NT/95, OS/2 Warp. 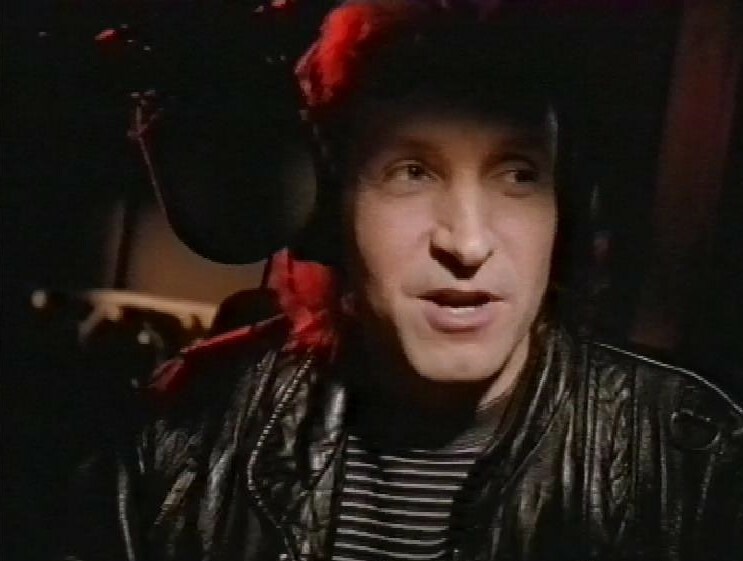 And there’s an advert for Talk Radio that had, amongst the many faces it featured of people on the station, three particular heroes of when I was a lot younger. 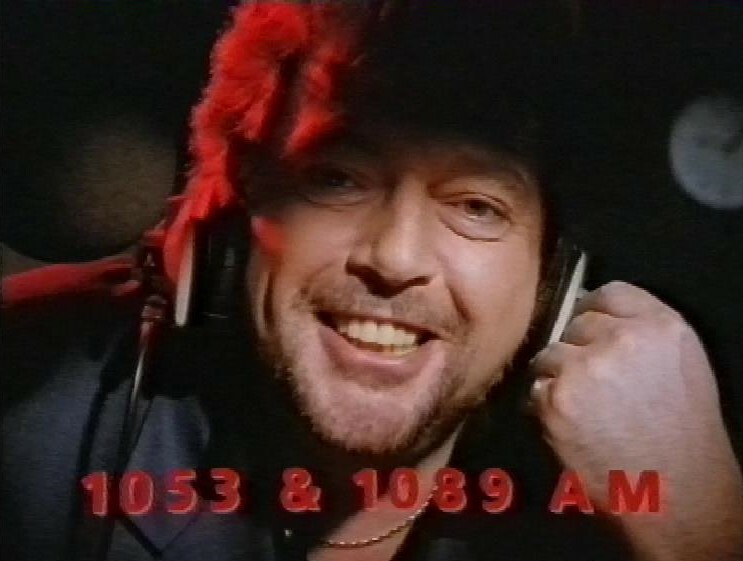 Jeremy Beadle, whose Sunday Night phone-in on LBC was probably the reason I now go to bed so late. Tommy Boyd took over that slot when Beadle was sacked (possibly for asking a fourteen year old ‘How’s your love life?’ which is a bit less creepy when you know he asked almost everybody that). I think Tommy Boyd might have turned into a ‘shock jock’ in recent years, which saddens me. 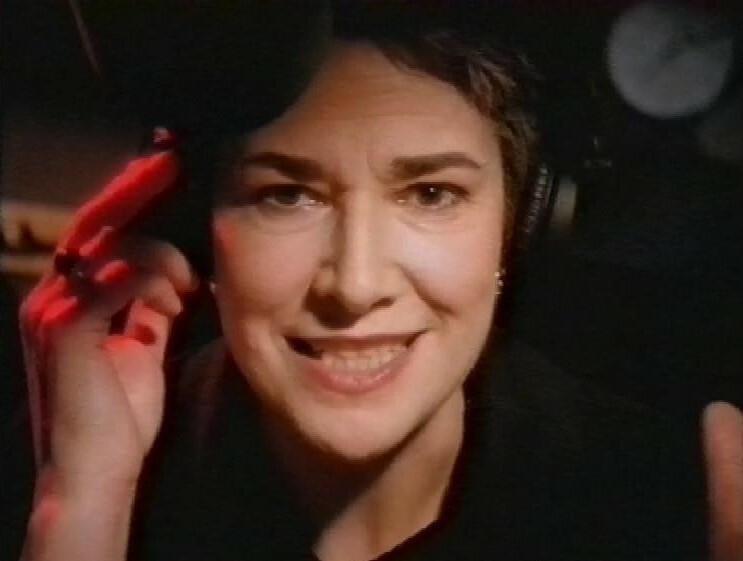 And Anna Raeburn, not particularly for her radio work, more for co-writing the brilliant Agony with Maureen Lipman. It’s movie time, with a couple of very different movies. First, from writer/director Lawrence Kasdan, it’s Grand Canyon. I’ve never watched this before, or if I have, I’ve forgotten it completely. It has a good cast, starring Kevin Kline as an immigration lawyer, not that you’d know from anything that happens in the movie. In this scene, we also glimpse Lawrence Kasdan, actual director of this film (and writer of Raiders of the Lost Ark among other things). 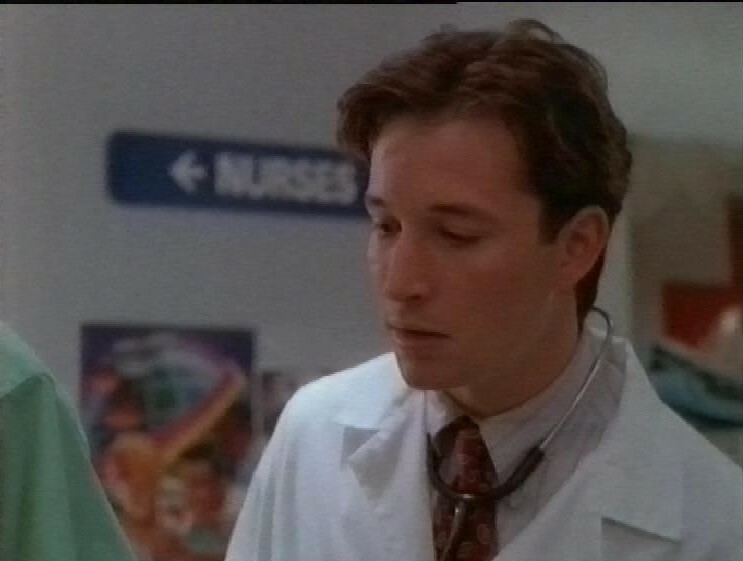 Kline is married to Mary McDonnell, and they are getting to the point in life when their teenage son is starting to become independent. Also in the cast, Mary Louise Parker plays Kline’s assistant, who he slept with once, and who now is unsure where she stands. 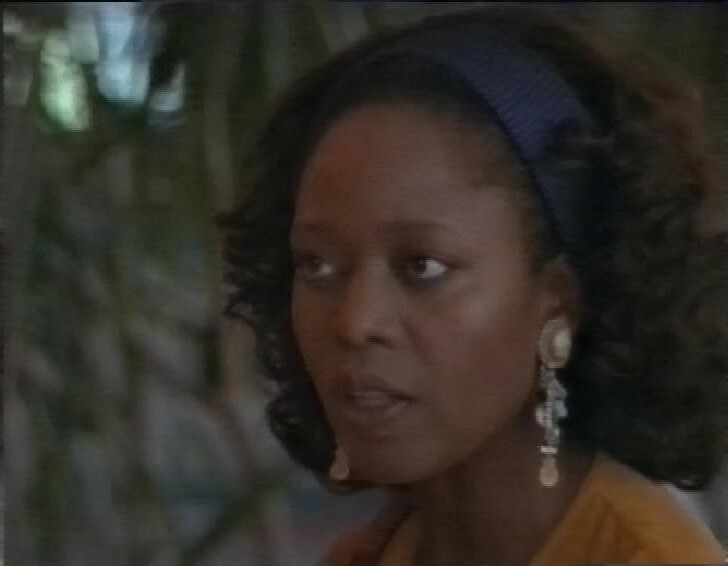 She’s friends with Alfre Woodard. It’s a very odd film. Because it’s following several characters, the narrative feels a bit unfocused. There’s some nice character moments. 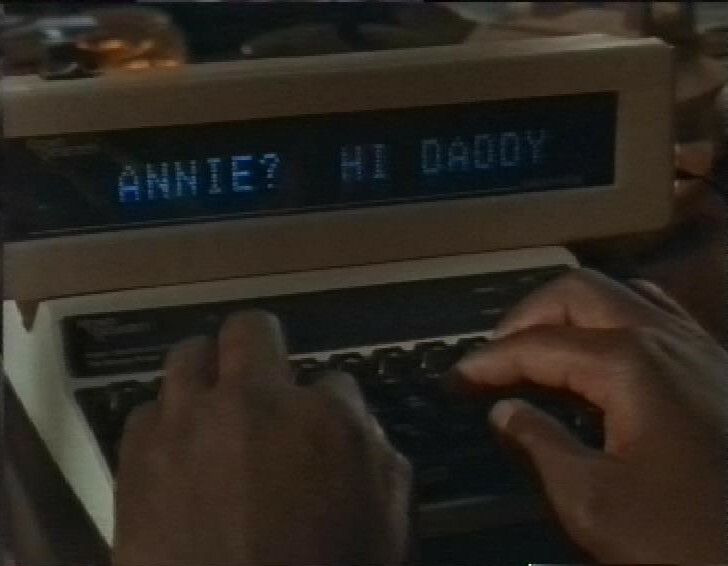 Glover has a deaf daughter at college, who we only see through the text device he uses to communicate with her. It beeps an awful lot, but I’m assuming that was added for the film. McDonnell, shortly after sending her son off to be a camp counsellor, is jogging when she finds a baby crying in some bushes. Rather than take the baby straight to a hospital or calling the police, she takes it home, and it’s still there when Kline comes home. You wonder if she’s having a breakdown, but they take the baby to hospital, and then consider adopting her. Steve Martin gets shot in the leg by a mugger, briefly flirts with changing the films he makes, but by the end is back to his old self, but with a limp. Kline sets up Glover and Woodard on a date, and they hit it off. In the end, Kline and McDonnell having adopted the lost baby, everyone goes on holiday to the Grand Canyon. It’s a metaphor. After this piece of worthy social drama, our next presentation is something a little less highbrow. Perhaps it’s the kind of film which Steve Martin’s character would be making. 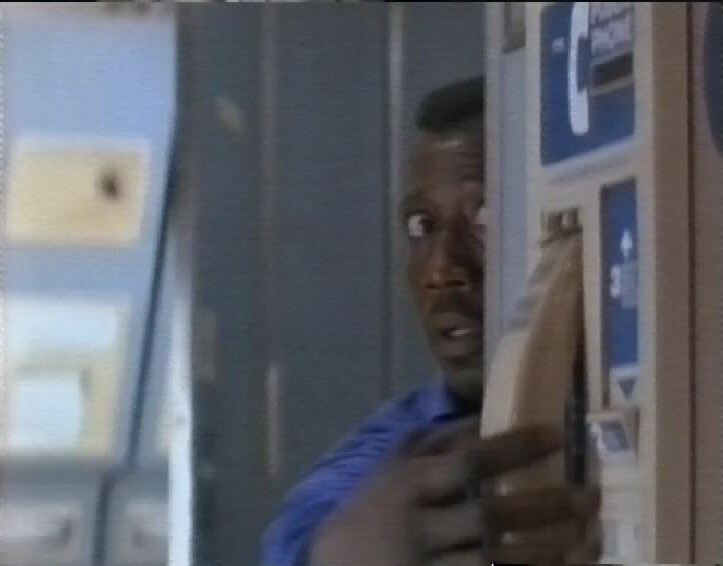 It’s Passenger 57, a Wesley Snipes action movie. It starts with an introduction to our villain, Charles Rane, played by Bruce Payne. You can tell he’s nasty, because, about to undergo cosmetic surgery to change his appearance, he tells the doctor he doesn’t need any pain relief “because there will be no pain”. I’m not sure what to take from this. Does he mean he has no pain receptors in his face? 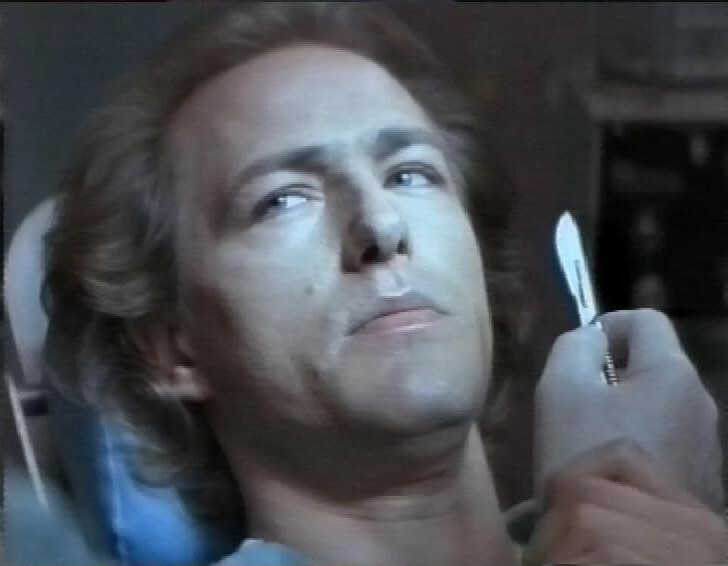 Because I don’t care how good a surgeon you are, slicing into someone’s face with a scalpel is always going to hurt. Before the surgery can commence, Rane somehow intuits that armed police are about to storm the building, as he jumps out of the chair and runs away, but he’s caught after a footchase. 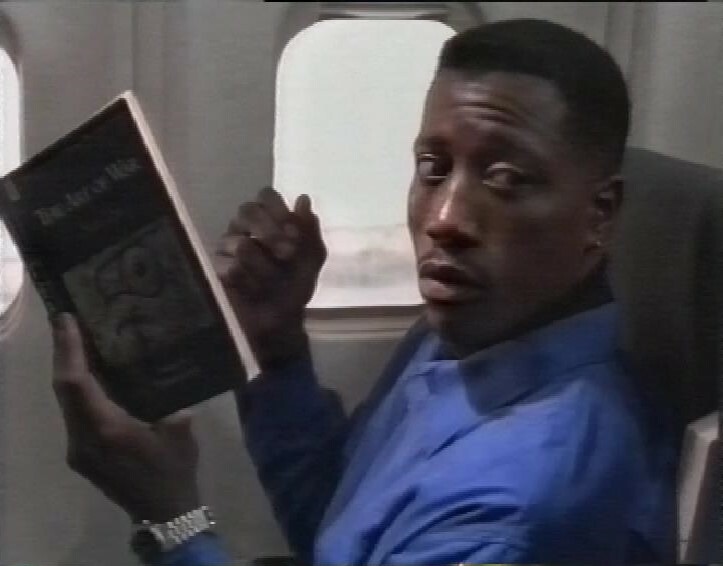 Cut to an aircraft, and Wesley Snipes is on board. But what’s this? Is he a hijacker? No, he’s doing some security training for airline staff, and gets a bit snotty with the flight attendant there, Alex Datcher, who tries to disarm him, rather than complying, which is what he’s training them to do. Snipes’ friend Tom Sizemore talks to him about how he needs to overcome his tragic back story and “get back in the game”. Rane, in prison, talks to his lawyer, who floats an insanity defence, which causes Rane to act like a totally insane person, bashing the lawyer’s head on the desk and forcing him to repeat that his client is not insane. This film does not want any shades of grey around this man. 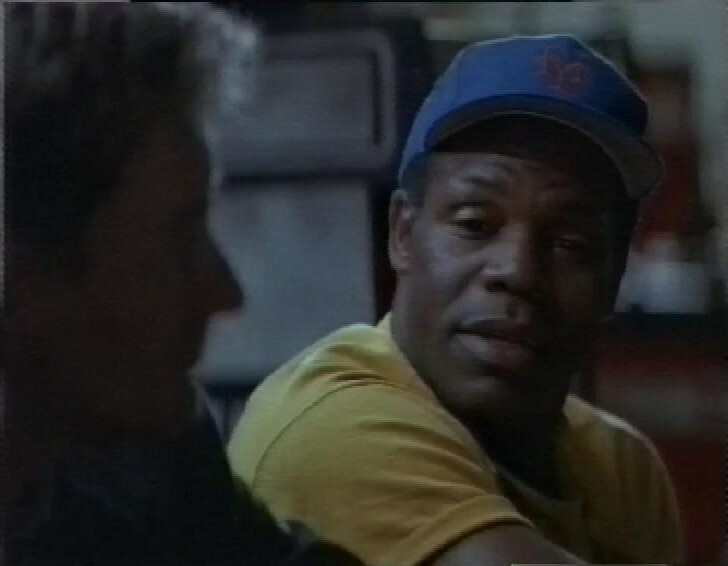 Alone in his flat, we now get to see a flashback to Snipes’ tragic back story, when an armed man holds his wife an gunpoint, then shoots her dead. Snipes takes a flight, and would you believe it? That’s the flight that villain Rane is being transported on. Also on the flight crew is Elizabeth Hurley. And inevitably, Alex Datcher, the flight attendant Snipes got snippy with in the training session, is also on the flight crew. Now here’s a thing. 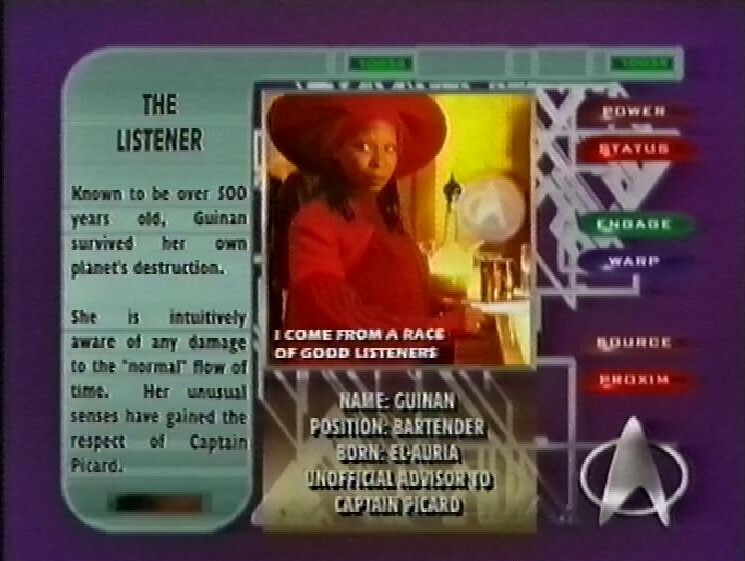 We know Datcher and Snipe have a connection, so casting Hurley as another attendant slightly telegraphs her role in things, I think. She was a name, so not someone you’d cast as cannon fodder, and since the rules of action films dictate that only one of the flight crew gets to be Wesley Snipes’ special assistant, that only leaves her working for the bad guys. Of course Wesley is reading Sun Tzu’s The Art of War. After some airborne banter between various of the passengers, Wesley avoids the boredom of talking to the old woman next to him by hiding in the toilet. Lucky for him, because that’s when Rane’s evil plot springs, as Liz Hurley pulls out a gun and shoots the FBI officers accompanying him. I think she hasn’t practised enough with a gun, as she closes her eyes when she shoots. It’s lucky Wesley was in the loo, as it means he can grab the skyphone. Here’s the obligatory long-haired hijacker. Wesley attacks a hijacker, and there’s a standoff. 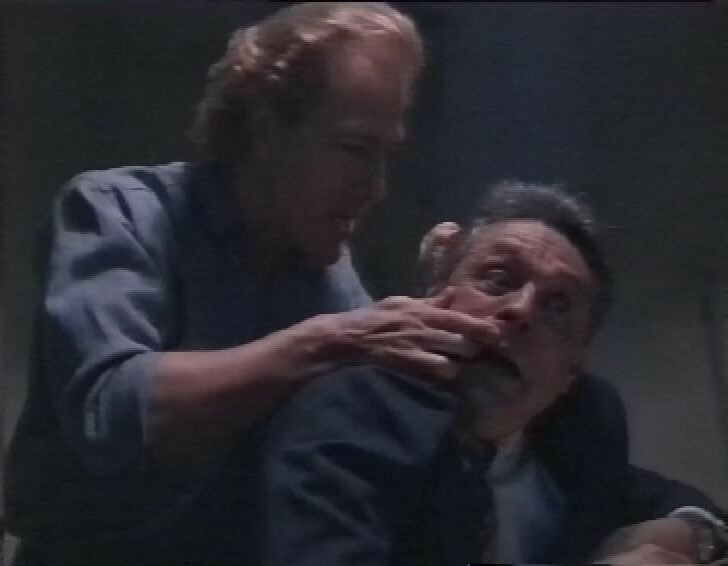 Inevitably, we’re reminded of Wesley’s tragic back story as he holds flight attendant Datcher hostage. But almost as soon as he’s grabbed her, he tosses her aside and grabs a bloke we don’t know or care about. So it’s not surprising at all when he kills him. The film is taking no chances that we might not think he’s evil. 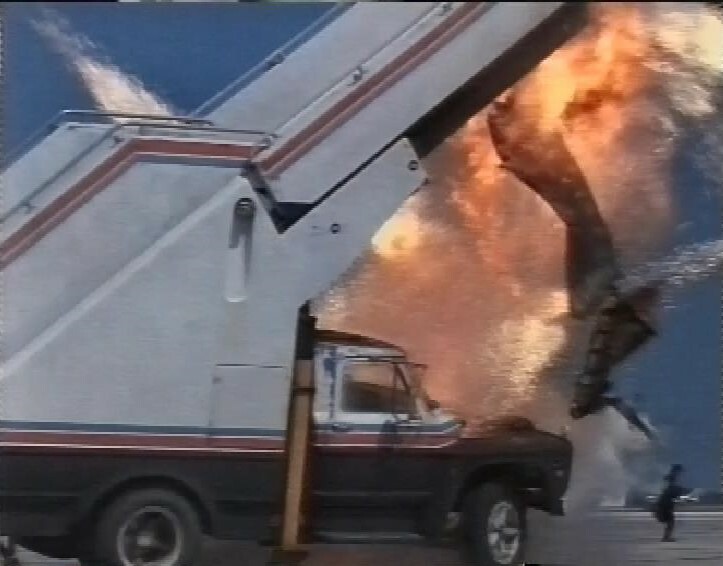 Snipes and Datcher escape the stand-off and get into the elevator to the cargo deck, where he has to do some high kicking to take out yet another hijacker. He gets the plane to start dumping fuel, hoping to force a landing. 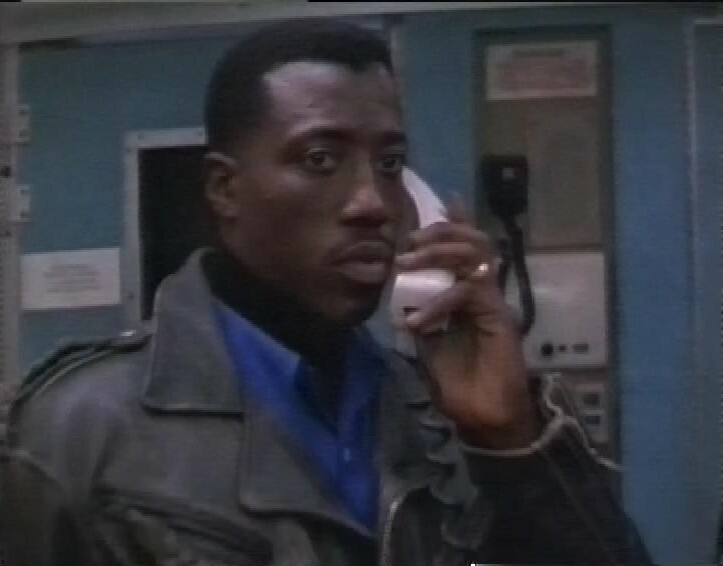 There’s a phone call between him and Rane, clearly wanting to emulate the phone calls in Die Hard, but the dialogue isn’t up to it, although Snipes’ last line is good. “You ever play roulette? Let me give you a word of advice. Always bet on black.” with a dramatic dolly in to Snipes. It’s only slightly ruined by Alex Datcher putting her head back strangely. 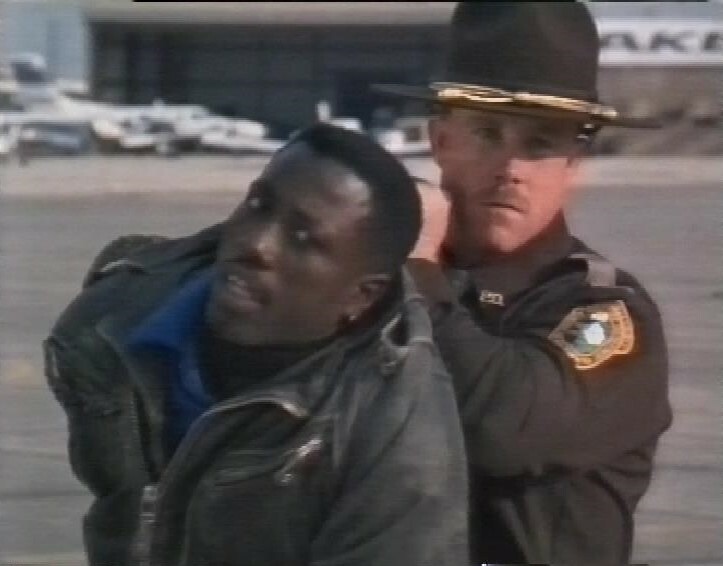 The plane is forced to land at a country airfield, and Snipes is pushed out by a bad guy as he’s trying to jump. Then he’s apprehended by the local bumbling sheriff. I like the fact that, while the film doesn’t make a big deal of Snipes’ ethnicity, it also doesn’t ignore it. 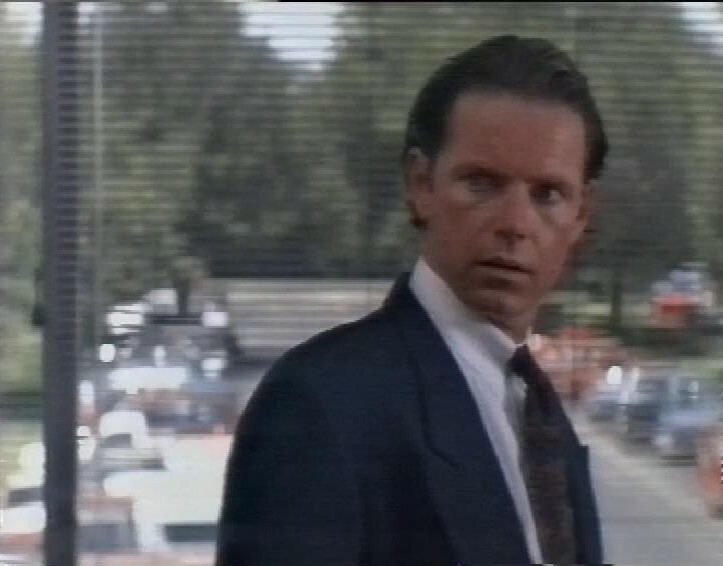 Bruce Greenwood appears as an FBI agent. He doesn’t really have much to do. 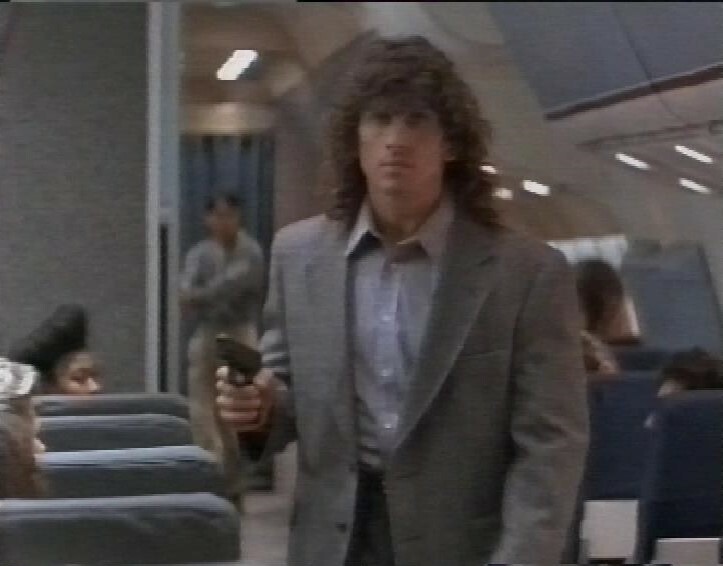 Rane and some goons manage to get off the plane undetected while a lot of passengers are released to create a distraction, but Snipes is wise to him and chases after them after doing some more martial arts on the two cops holding him. 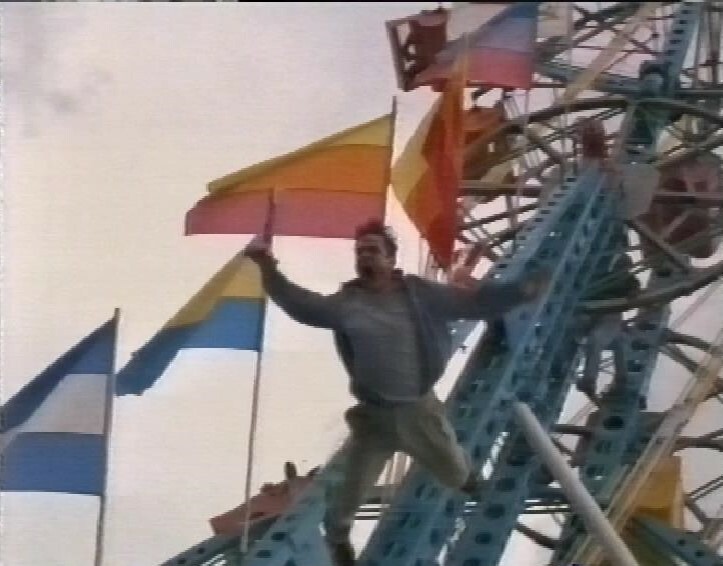 There’s a funfair near to the airport, and there’s some cat and mouse between Snipes and the bad guys, one of whom he kicks off a big wheel. 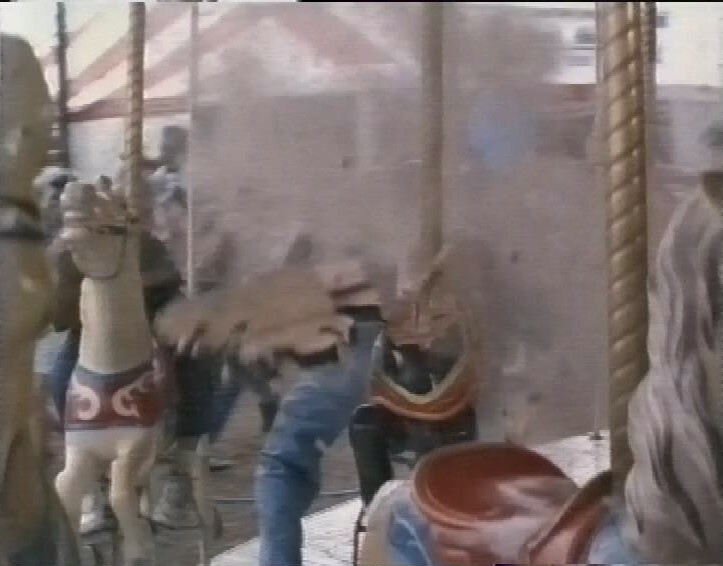 Rane doesn’t like carousels very much, judging by the number of horses heads that explode as he’s shooting at Snipes. He catches Rane, but his men still have a lot of hostages on the plane. So after some more posturing between them, it’s decided to let Rane think he’s getting back on the plane. But Rane has more men among the police marksmen, who take out the FBI officers walking him up the steps to the plane. There’s another big shootout, and in the maelstrom of action, the mobile staircase up to the plane, having reversed away from the plane. is shot a few times, and explodes in a ball of fire. This film really is majoring on the ridiculous. 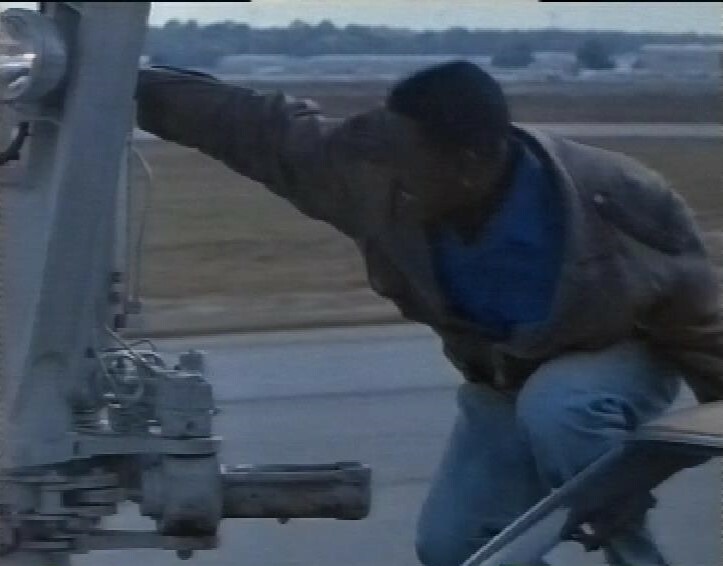 So the plane starts taxiing for takeoff, and Snipes has to climb onto the front wheel to get back on the plane. After punching Liz Hurley in the face, only Rane is left, so there’s a big, clumsy fight in the cabin, and of course, there’s some rapid decompression going on as well. 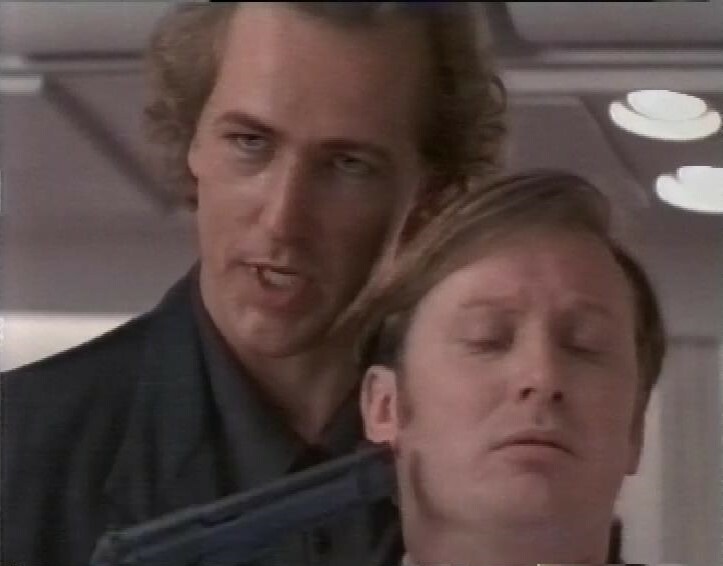 Rane meets his end when Snipes kicks him out of the plane, giving him a fall from a great height in homage to the late Hans Gruber. 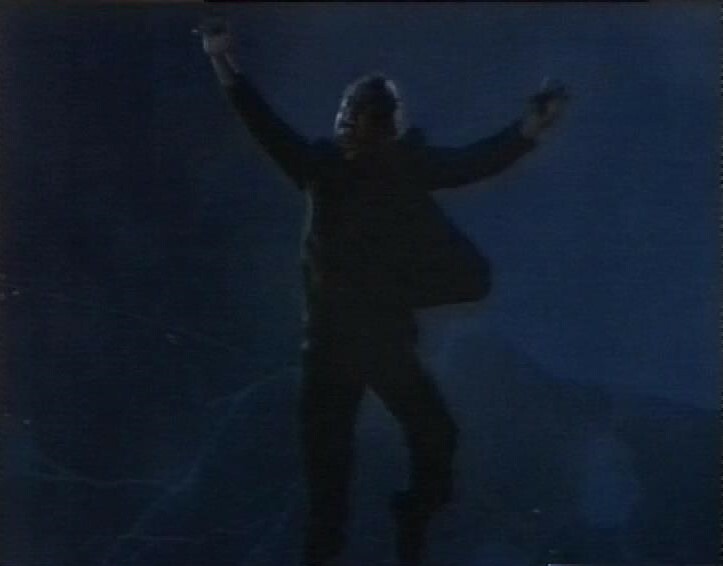 The film doesn’t record whether he landed on something hard, as befits a villain in a film like this, so I’d like to think he ends up impaled on a church steeple somewhere. That’s about it. Enjoyable without really troubling anyone’s top ten list, and the music is so Die Hardy it’s painful. 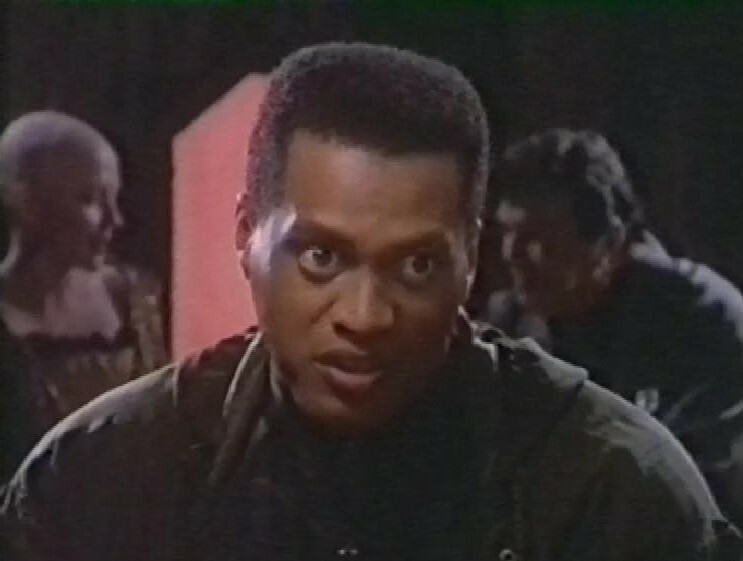 But Snipes is good at this kind of stuff, Payne plays the psycho well, and I was genuinely surprised when Tom Sizemore turned out to actually be the best friend he appeared to be at the start. In some cases, casting isn’t a spoiler. After this, the recording continues with about 30 minutes of a Joe Mantegna baseball film called The Comrades of Summer. In the adverts, there’s a News of the World advert touting a book written by the children of Fred and Rosemary West. The daughter is called Mae West. You could tell they were monsters. 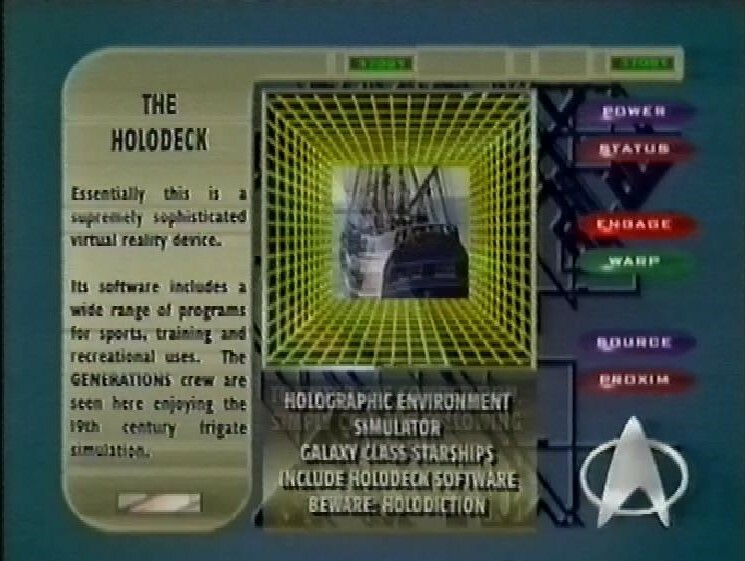 This is a short tape, with a couple of episodes of Deep Space Nine. First, Playing God. Dax is mentoring a Trill who’s hoping to be a candidate to have one of the symbiont worms implanted. So we get to see some of Dax’s leisure time. Lots of Klingon Opera, early morning wrestling and other stuff that the Trill seems to disapprove of. The station is suffering an infestation of Cardassian Voles. Nice creature work. There’s Jeopardy when a ‘pocket universe’ opens up on the station, and threatens to grow and consume it. Signs of life are discovered in it, so there’s a moral question as to whether it’s right to destory it, so in the end, Dax and her pupil save the day by flying it through the wormhole. The next episode is Profit and Loss. 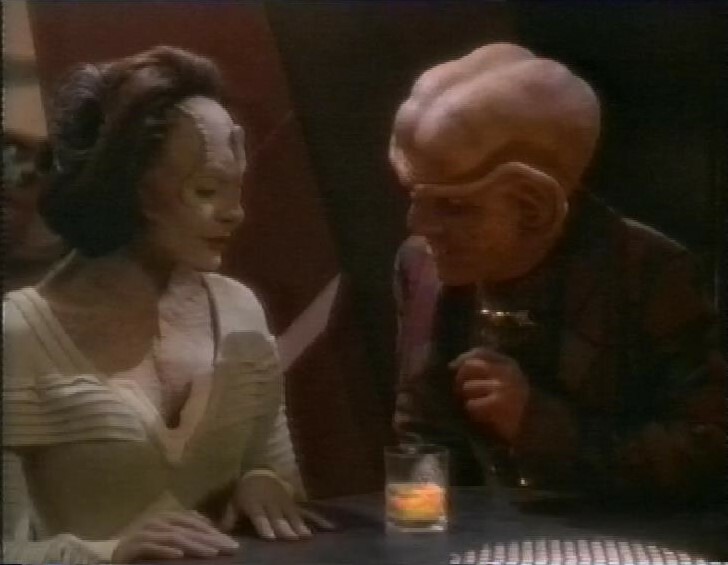 On the minus side we have Odo meeting a Cardassian woman he had some kind of affair with before the federation took over the station. 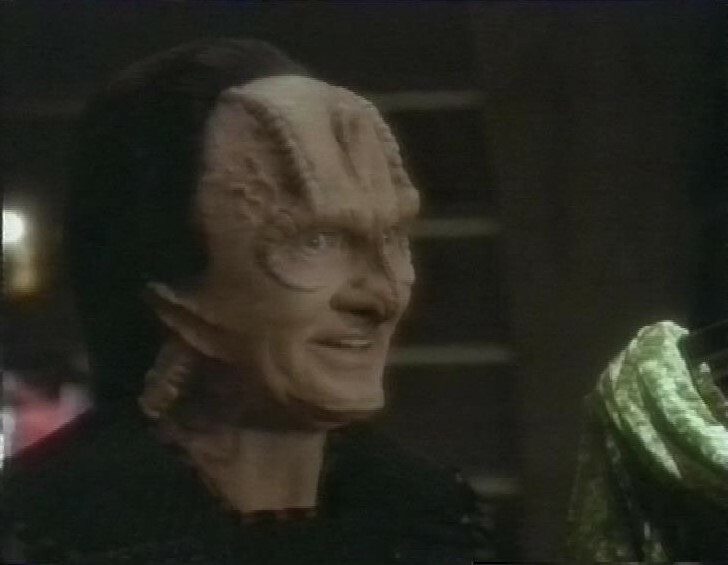 On the plus side, there’s plenty of Andrew Robinson’s Garak in this episode, taking more of an active part in the plot than usual. A couple of middling episodes then. I remain a little unconvinced that the whole Trill simbiont thing isn’t ‘Invasion of the Body Snatchers’ levels of horror. I find it all a bit creepy, the abandonment of personality by the hosts. But that’s all on this tape, not even any ad breaks this time. Mostly The Simpsons on this tape. First, Fear of Flying, in which Homer pretends to be an airline pilot so he can drink in their bar, and Marge confronts her fear of flying, caused by some childhood trauma. Anne Bancroft plays a psychiatrist. And there’s a Cheers crossover, featuring almost the whole cast, including Ted Danson and Rhea Perlman. George Wendt and John Ratzenberger (although not Kelsey Grammer). 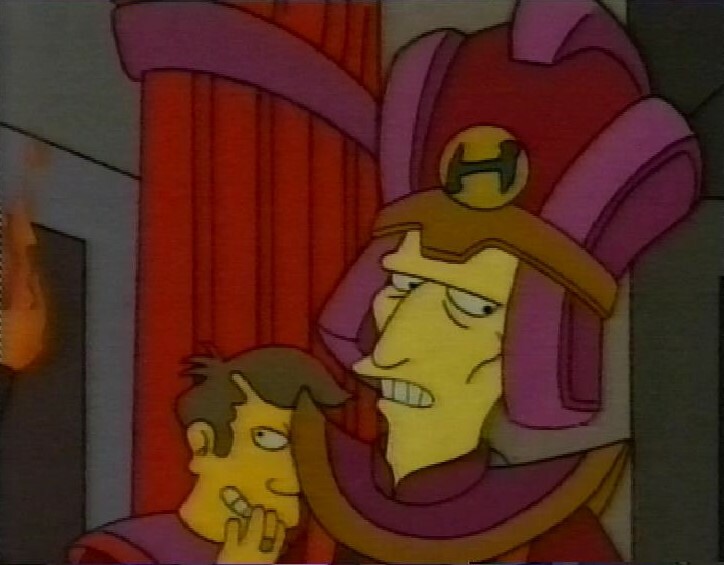 Next, Homer the Great, featuring a guest appearance by Patrick Stewart as the head of the ancient order of Stonecutters. After this episode, recording continues for a bit with Beverly Hills 90210, then recording switches to the end of the news. There’s weather from Peter Cockroft, and trailers for Ghostswith Kevin McNally, and Heroes and Villains with Rowan Atkinson. Then, an episode of One Foot in the Grave. Victor manages to scald himself in the shower. He gets a job as a chauffeur for John Bird. When he tells a van full of rugby players off for bad parking, they have their revenge on his car. A second car has a mishap with a garage with a missing floor. And the third one ends up worse off after an encounter with a tank. 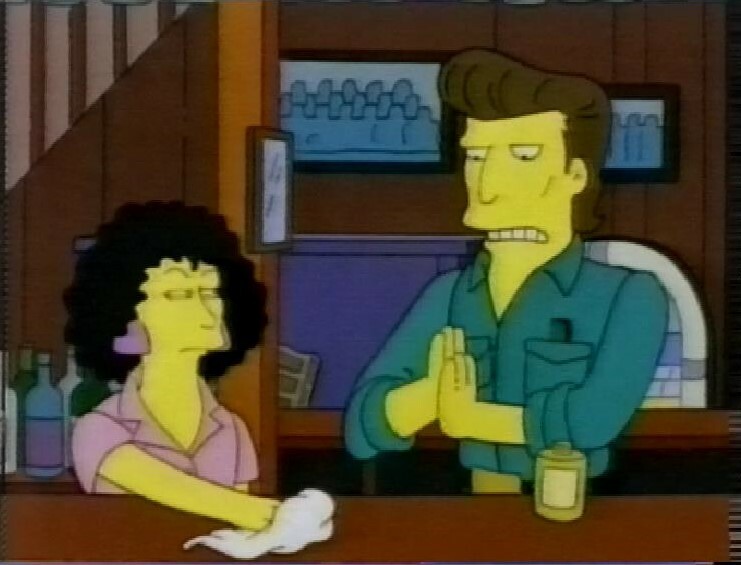 After this, back to the Simpsons with And Maggie Makes Three. Homer tells the story of when Maggie was born. 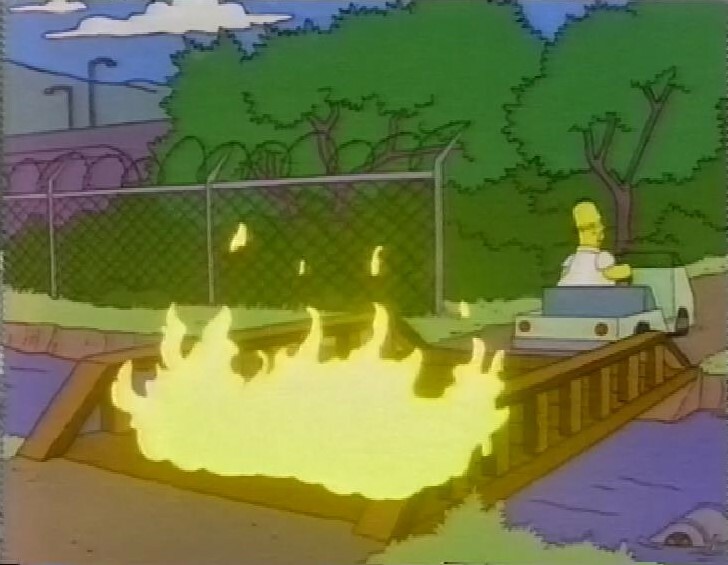 He’s just reached the point where he’s out of debt, so he quits his job, literally burning his bridges. 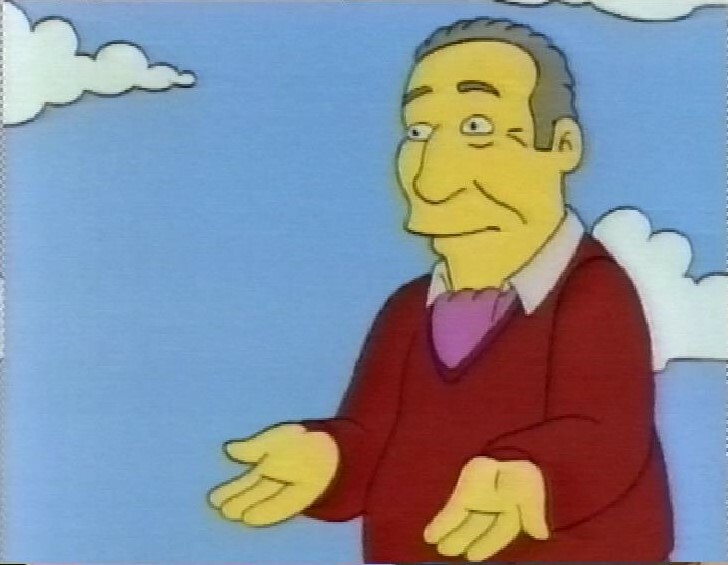 His ideal job is at the bowling alley, but when Maggie is on the way, he can’t afford to stay there, and has to crawl back to Mr Burns, literally. 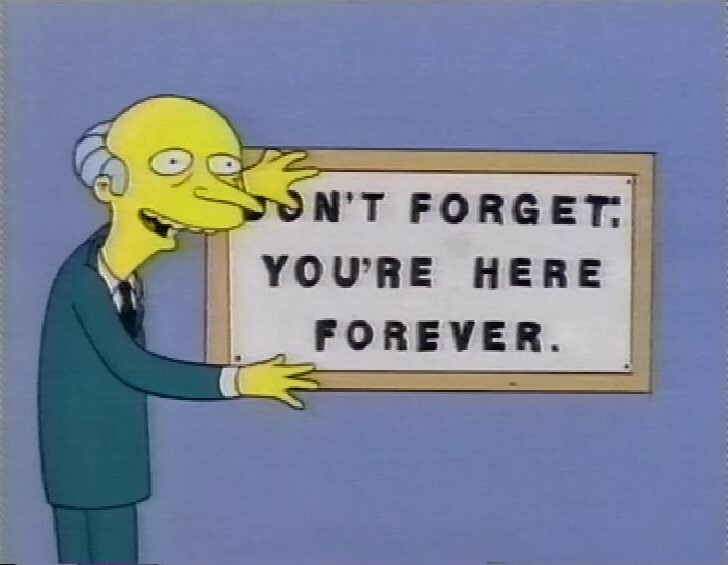 Returned to his old job, he’s given a demotivational poster. 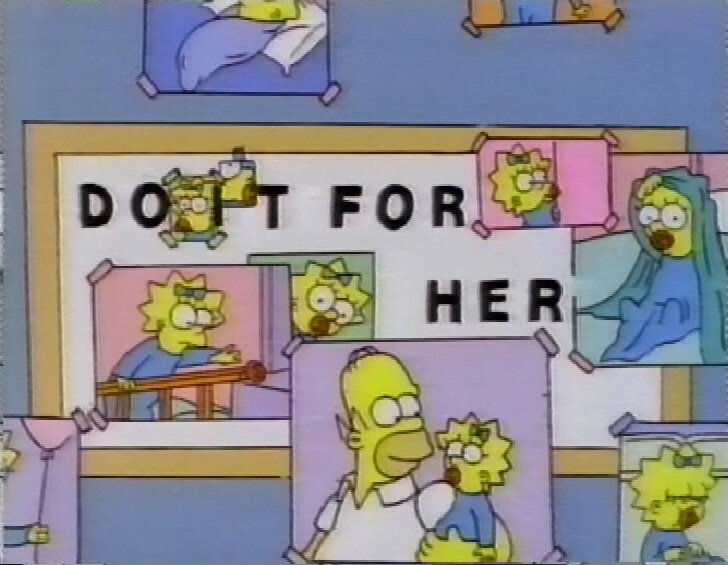 Before Maggie arrives, he worries that he can’t love her, because of his job, but (this being generally a heartwarming show) he loves her from the start, and when the kids ask why there’s no pictures of Maggie at hime he tells them he keeps them where he needs them the most. Regular readers will be unsurprised to learn this always makes me cry. 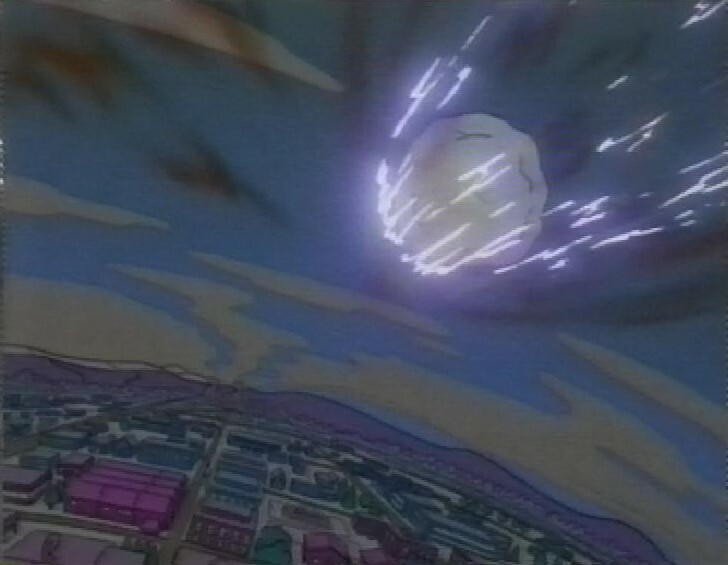 Next, it’s Bart’s Comet, in which Bart discovers a comet, which then looks like it’s going to wipe out the town. 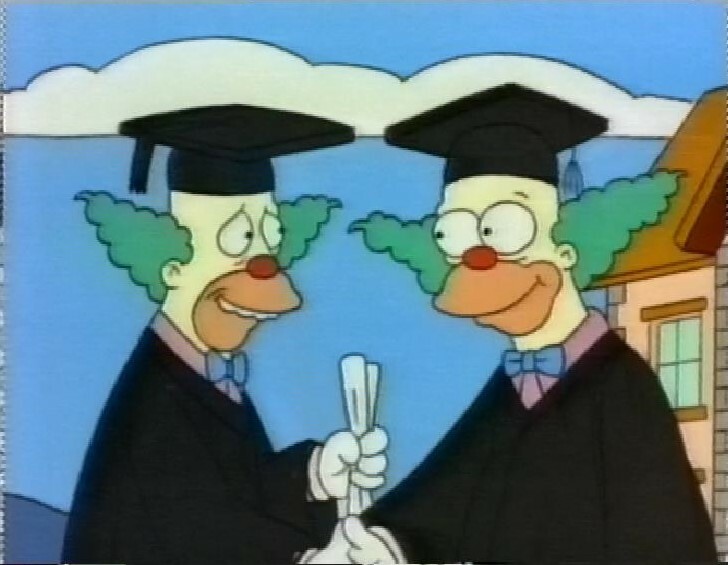 In Homie the Clown, Homer becomes a professional Krusty impersonator. 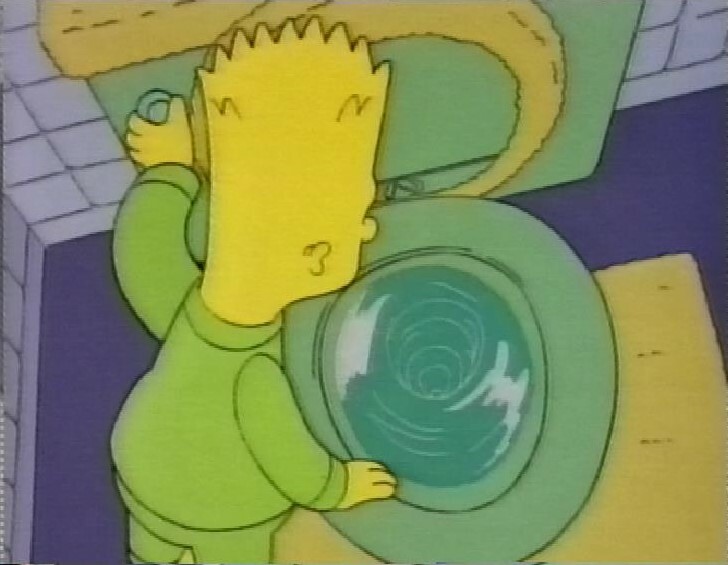 In Bart vs Australia, the whole episode is based on the myth that toilets and sinks drain in a different direction in the Southern Hemisphere. Which they don’t, really. Lisa explains it’s because of the Coriolis effect, which is a real thing, but the direction a sink drains in depends much more on the shape of the sink or toilet than the effect. Homer vs Patty and Selma guest starring Mel Brooks. 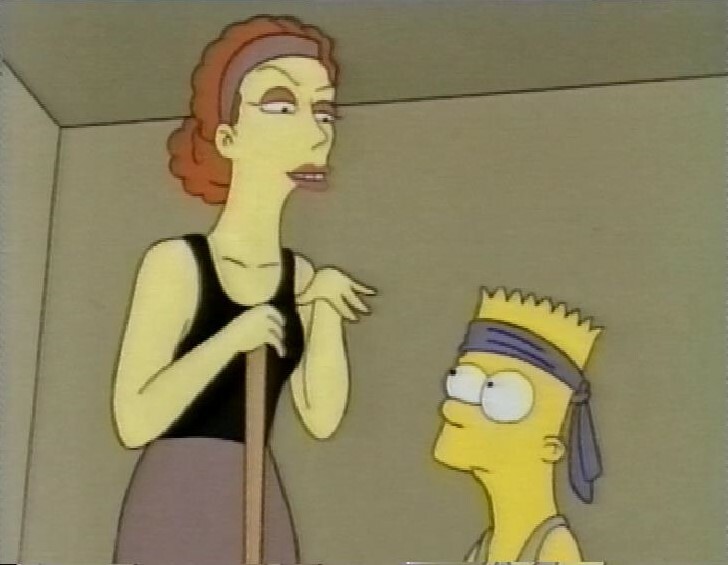 Bart takes Ballet. Of course, the rest of the kids ruin it. His teacher is Susan Sarandon. And finally on this tape, Lisa’s Wedding which I’ve already looked at before. After this recording stops, and there’s some Beverly Hills 90210 underneath. First on this tape, a couple of episodes of what I’ve listed as Rik Mayall Presents, but it might also be Rik Mayall In. First, The Big One. 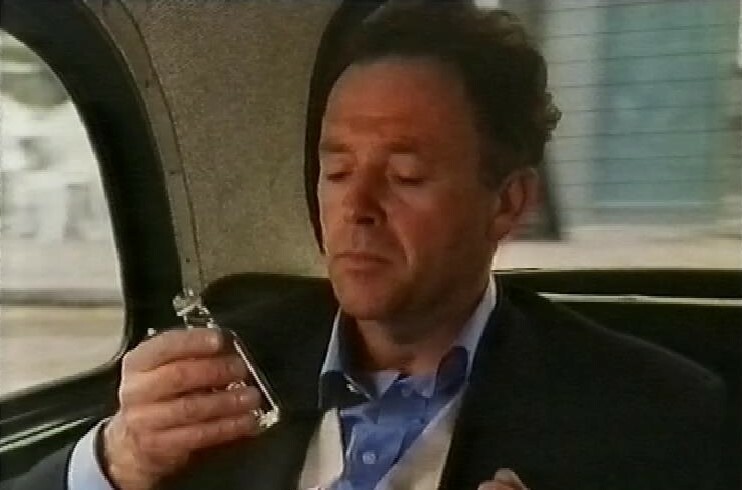 Rik plays a London estate agent, and a compulsive liar (perfect fit of job and inclination) who has to appraise a luxury apartment on sale after the owner’s sudden death, and he finds the man’s wallet and all his credit cards, so he pretends to be him, in order to seduce a girl he met, Played by Saffron Burrows. When he takes her out to a club, he’s recognised by a couple of gangster types, one of whom is played by Phil Daniels. 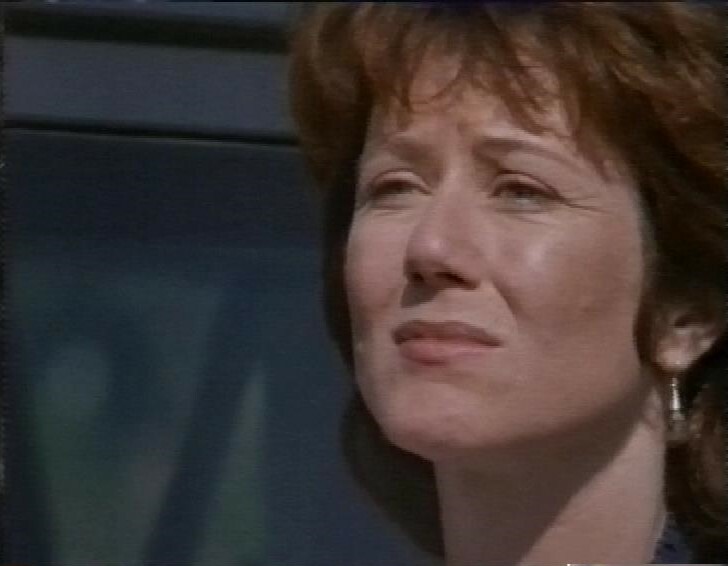 Back at the (borrowed) flat next morning, he’s awoken by a ring on the doorbell – it’s the dead man’s wife, Phyllis Logan. He manages to assure her he’s the estate agent, and it’s about the only true thing he says. One of the good things about this is the ludicrous stories he spins, particular about his twin brother who built hospitals in Africa. It’s not a bad story, and has twists and turns, and a stand-off clearly inspired by Reservoir Dogs. 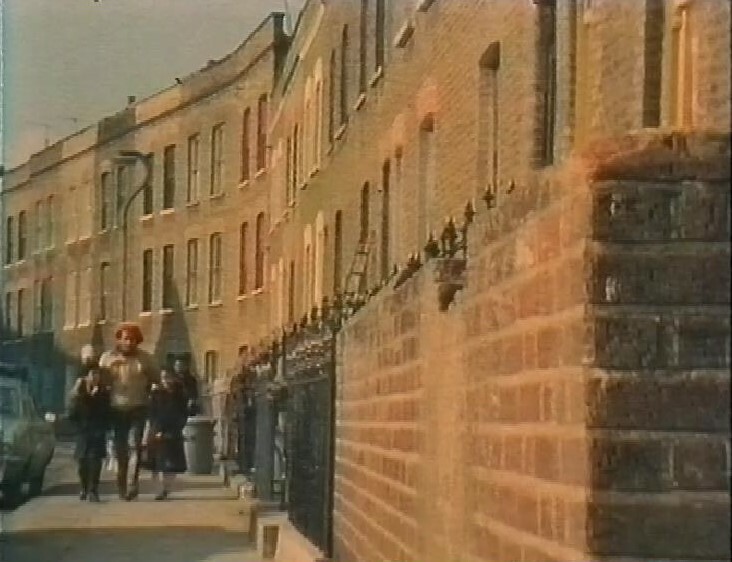 Next, another episode, called Dirty Old Town. 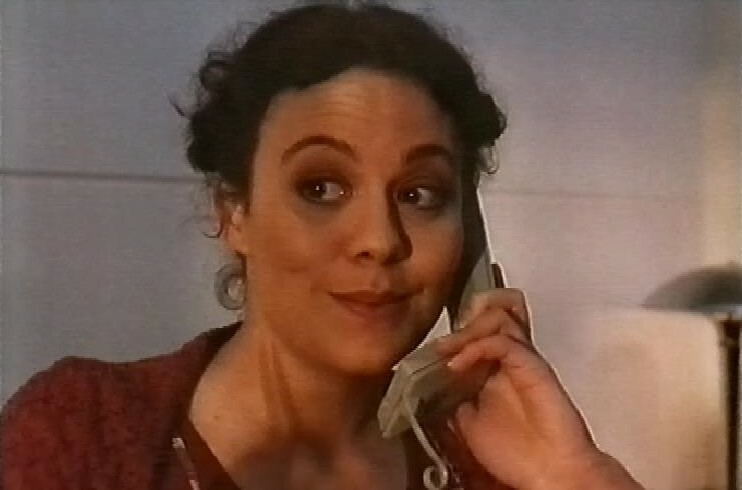 Helen McCrory plays the receptionist at a film company. A writer phones up about his meeting, but he’s late, so he has to bike in quickly. 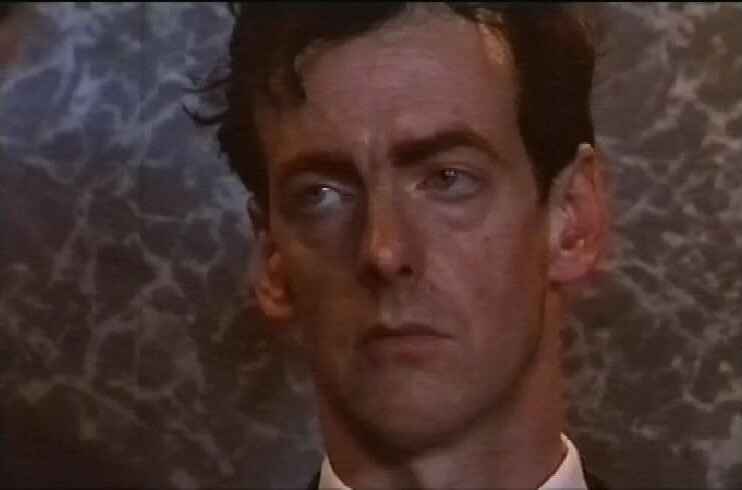 Michael Kitchen is the producer at the film company, and he’s a bit of a drunk, owing money. 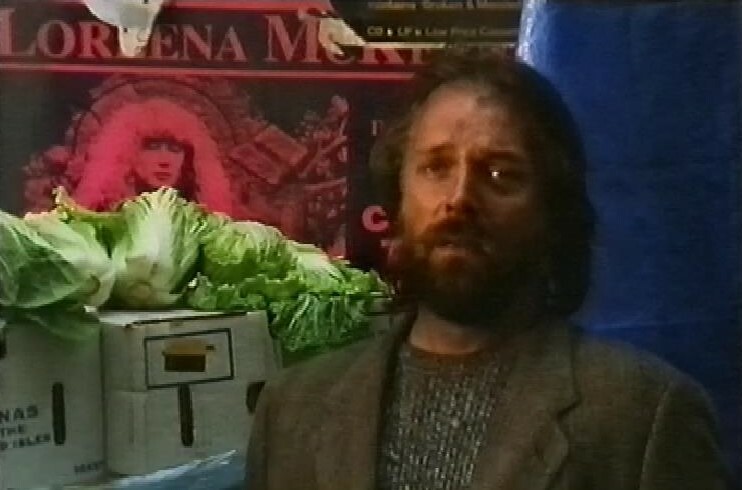 Rik Mayall plays a homeless man, living on the street near the film company. I have to admit, I do get a little distracted trying to location spot around London, as a lot of it was shot near Wardour Street (home of the UK film industry for many years). 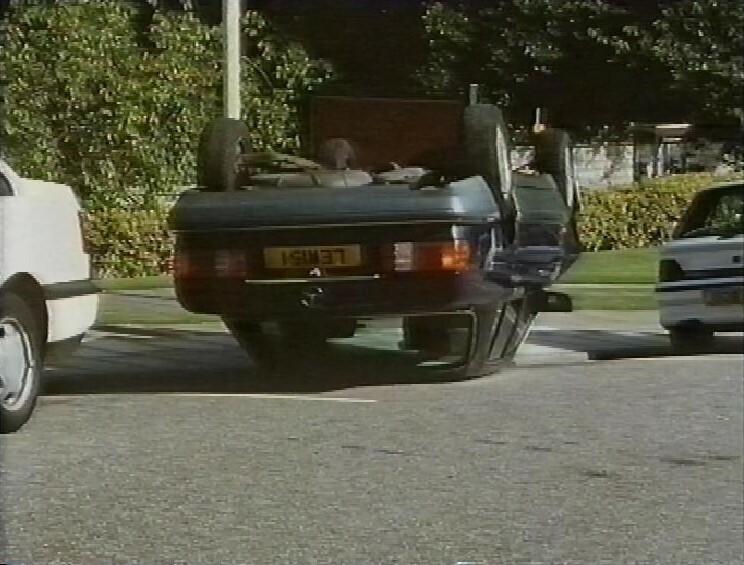 Just as Kitchen’s taxi is approaching his office, Mayall, possibly suicidal, walks out into the traffic, just as the writer is passing on the other side, and the taxi swerves, swiping the cyclist and clipping Mayall. 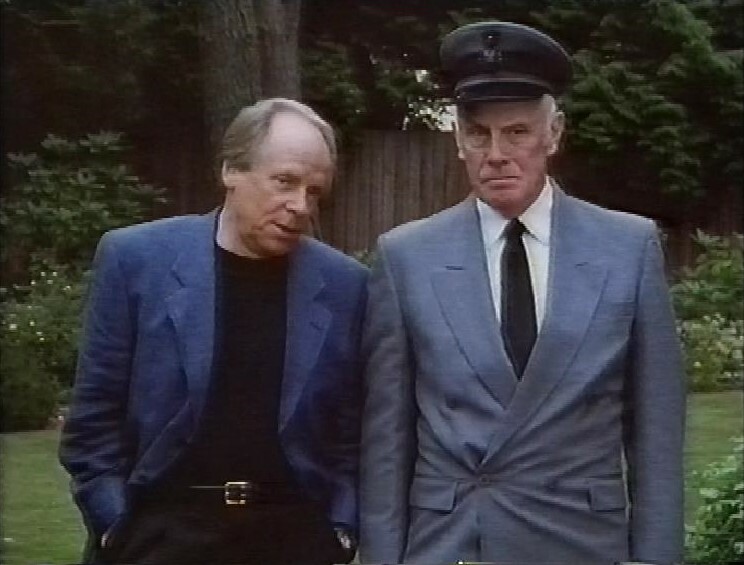 In the confusion, the writer’s satchel ends up next to Mayall, and he’s presumed to be the writer. I’m not quite sure why the other injured man isn’t paid equal attention, but I guess otherwise the mistaken identity plot wouldn’t work. The show doesn’t always treat the London geography properly. 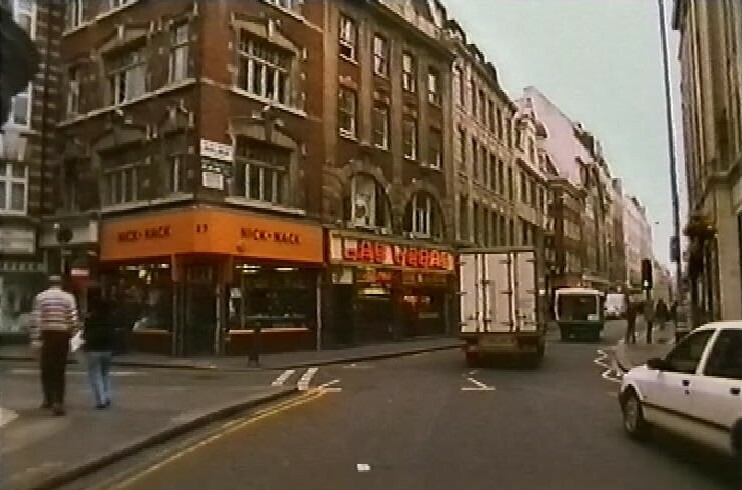 At one point they take a taxi from Wardour street, then we see them coming up Charing Cross Road, and turning into Old Compton Street. 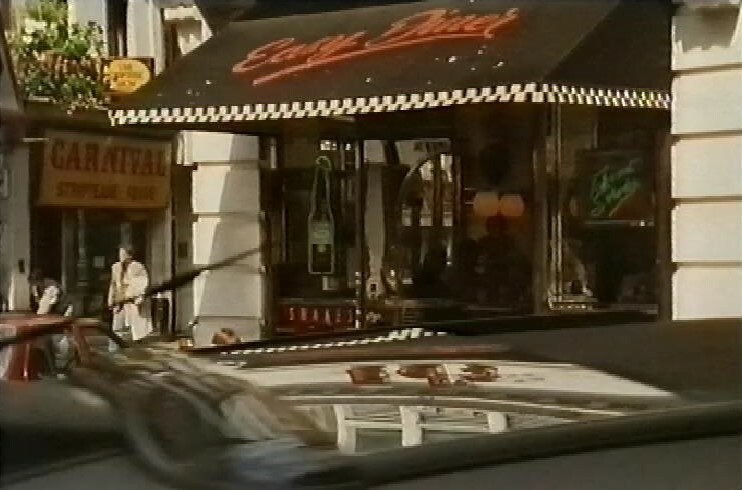 stopping outside Ed’s Easy Diner, which used to be my regular lunch spot when I used to go up to London every Saturday to buy comics and watch films. I can’t remember if Old Compton Street is one way, though, so I can’t decide if that’s a roundabout way to drive there. 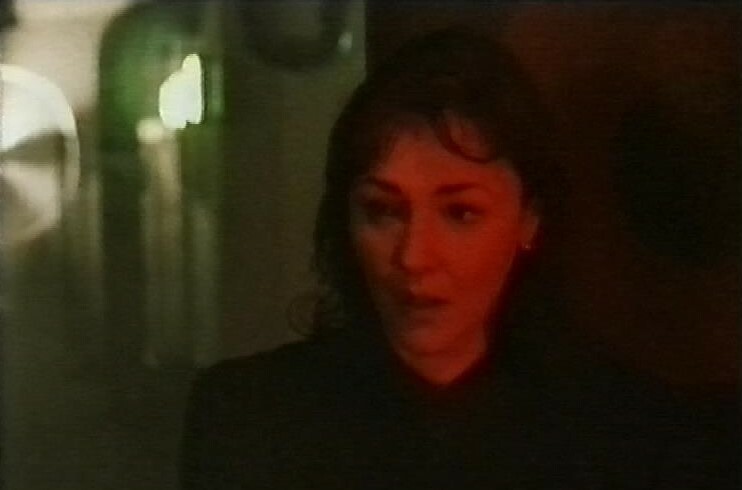 Another producer at the film company, who falls a bit for Mayall, is Frances Barber. Here they are talking about things in a car park that seems to have the same back-lit fans that used to be everywhere in Bugs. I presume they were a standard lighting item in the 90s. Again, not a bad story, and it manages something close to a happy ending. I’m not sure it was wise to run two stories with a Mistaken Identity plot back to back, though. And in this one, I’m not wholly convinced by the young writer’s almost slide into homelessness just because he broke his arm and lost his wallet and bag. After this, recording continues with an ITN news bulletin. One of the news reports is about the threats of the Ulster Unionist Party to withdraw support for John major’s government, and trigger an election. A small Northern Irish party holding the Conservatives to ransom? Do things ever change? 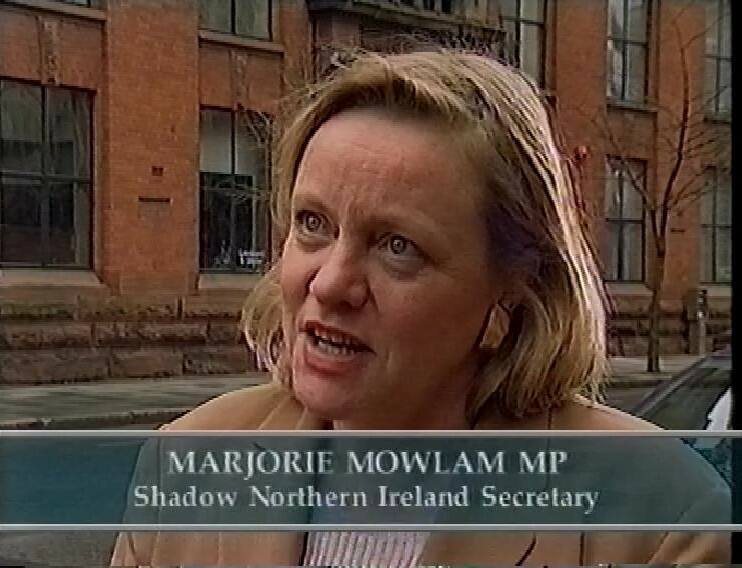 However, the Labour shadow NI Secretary is Marjorie Mowlam – I had no idea her name was Marjorie as I’d only ever heard her referred to as Mo. And of course, within literally minutes of seeing her in this news report, I scrolled down my Twitter feed to learn that yesterday was the 13th anniversary of her death, so there’s a big picture of her. I admit, this really freaked me out. After this, and some weather, from Martyn Davies and Rianna Scipio, there’s an episode of The South Bank Show. It’s all about four ‘Classic Widows’ – the wives of dead composers who have tried, with varied success, to promote their husbands’ work after their deaths. 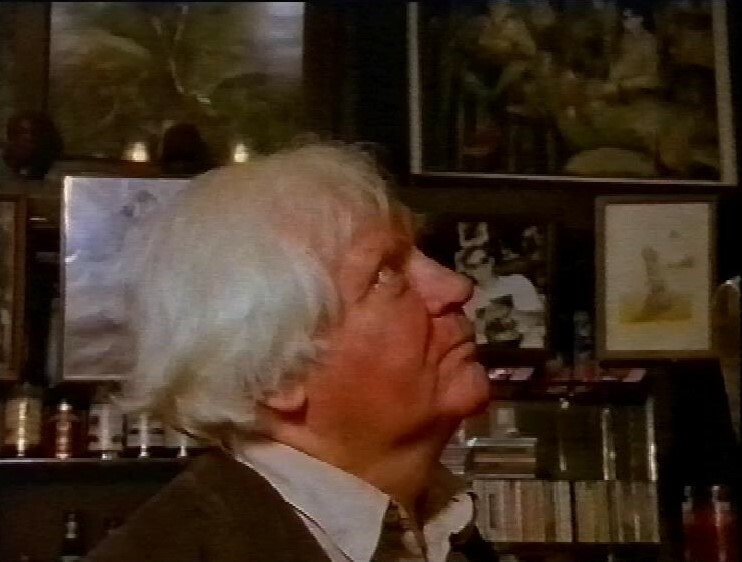 It shows a bit of Russell’s style, and he does make an on-camera appearance towards the end. 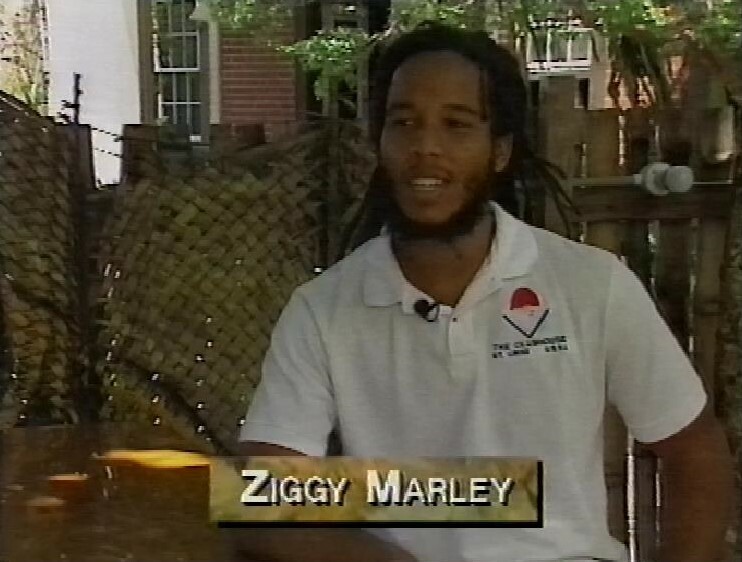 After this, there’s a strange programme, a 50th Birthday Tribute to Bob Marley. It’s strange because of the way it seems to have been made. 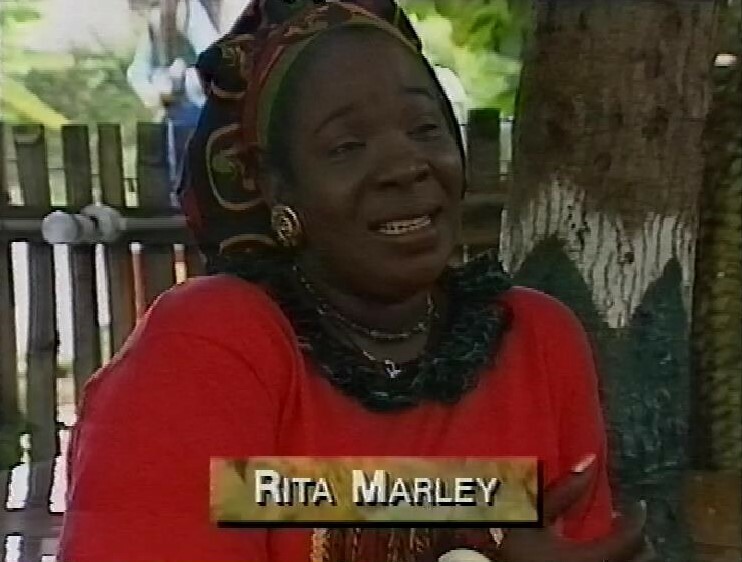 They have an interview with Marley’s widow, Rita, and his son, Ziggy, which would be the least you would expect. But then, we have Jackie Collins, talking about how much she loves his music, and whenever she wants to write a party scene, she’ll put on some Bob Marley to get in the mood. 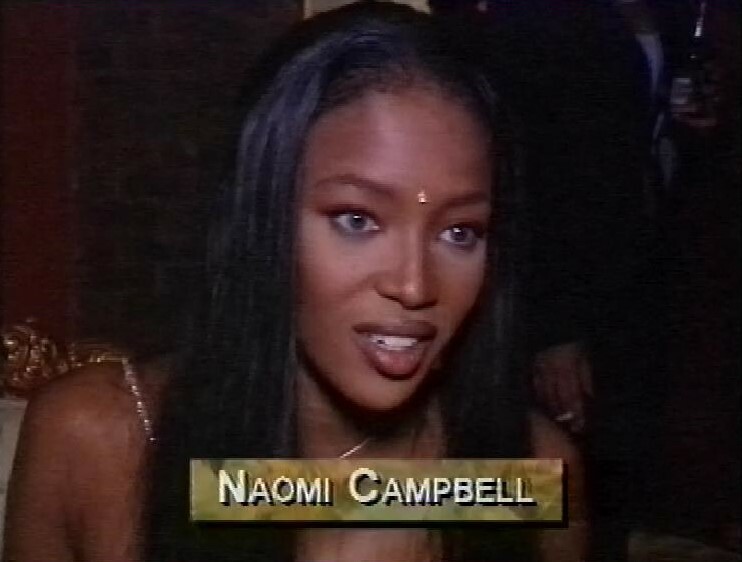 Naomi Campbell, at least, had met Marley – she actually appeared as a small girl in one of his videos. Although for such a brief time you can barely see her. 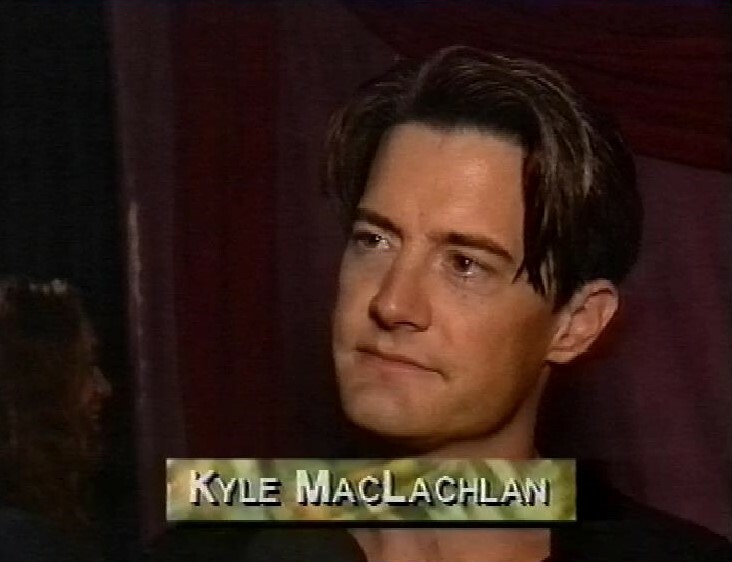 But the programme is full of random short interviews with various celebs and musicians, many of which look like they were taken at a premiere or a party. I suspect they might be from an actual event held to commemorate him, but they do all look like they were caught on the hoof in a lot of different places, and the subjects are a mixed bag. When Lady Kier of Deee-Lite thinks of Marley, she apparently thinks of a coffee shop in Amsterdam. Linda Evangelista is very very very sad that she won’t get to see him live. 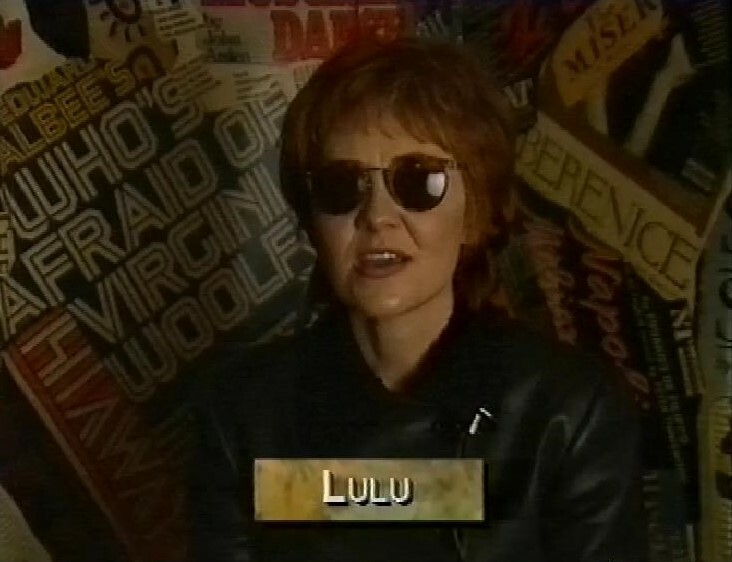 Lulu talks about his influence. 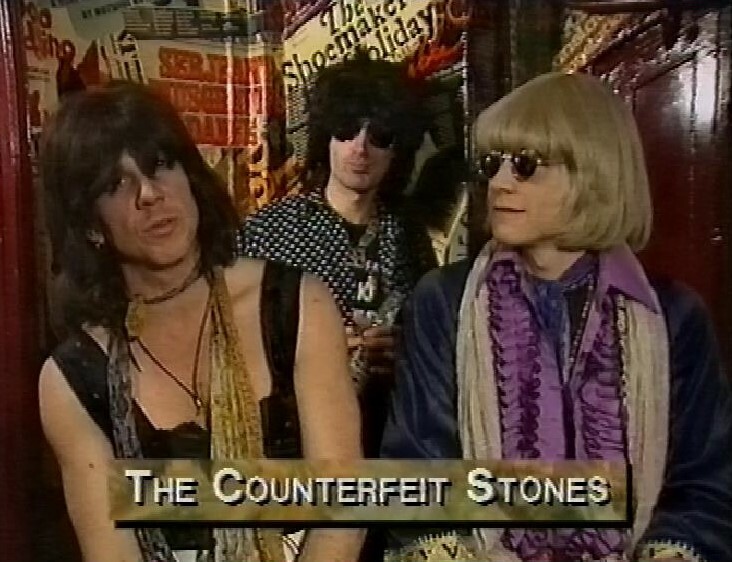 But you know the show is using absolutely every scrap of footage they have when we hear from a Rolling Stones tribute band. 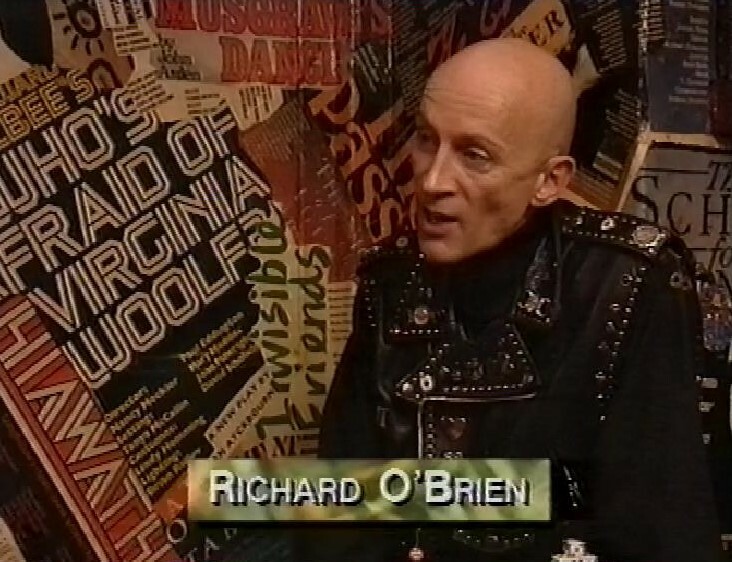 Richard O’Brien talks about the possibility of a Marley musical. Now, this brief bit with Tim Burton absolutely is not at a Marley event – that’s clearly an inflatable Jack Skellington behind him, so that’s a premiere for The Nightmare Before Christmas. 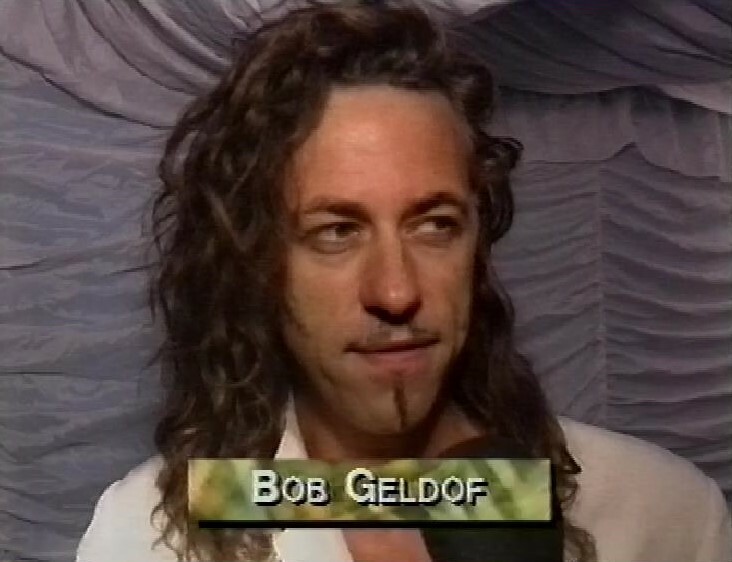 This is what leads me to suspect the makers of this documentary basically took their camera to every premiere they could find and just asked the celebs about Bob Marley, which would also explain why a lot of the comments are very vague. 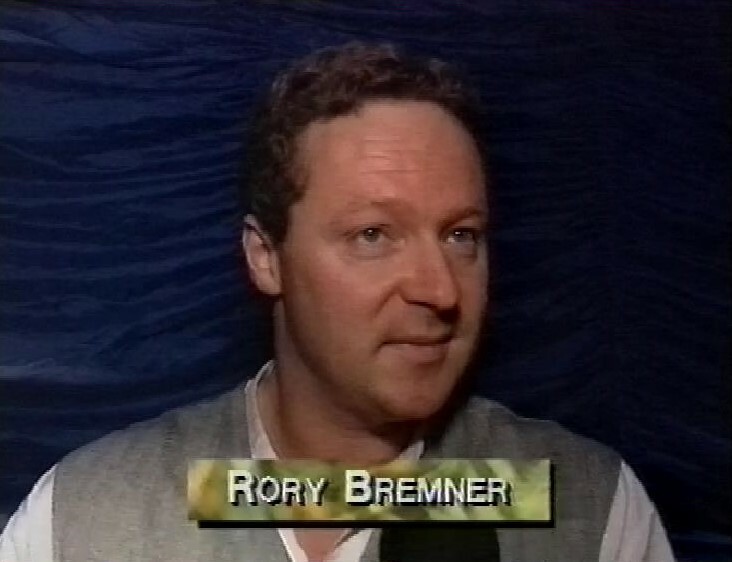 I mean, under ordinary circumstances, would Rory Bremner really be in your list of interviewees? 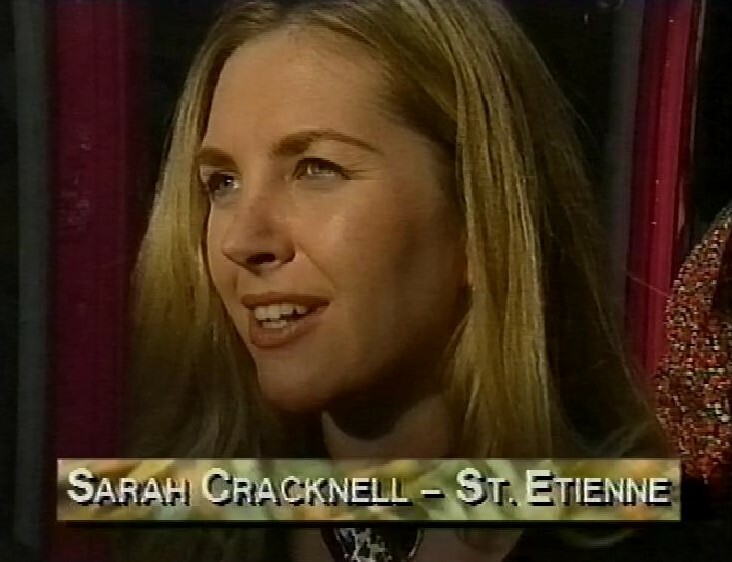 Sarah Cracknell is, at least, a musician. A very odd thing indeed. 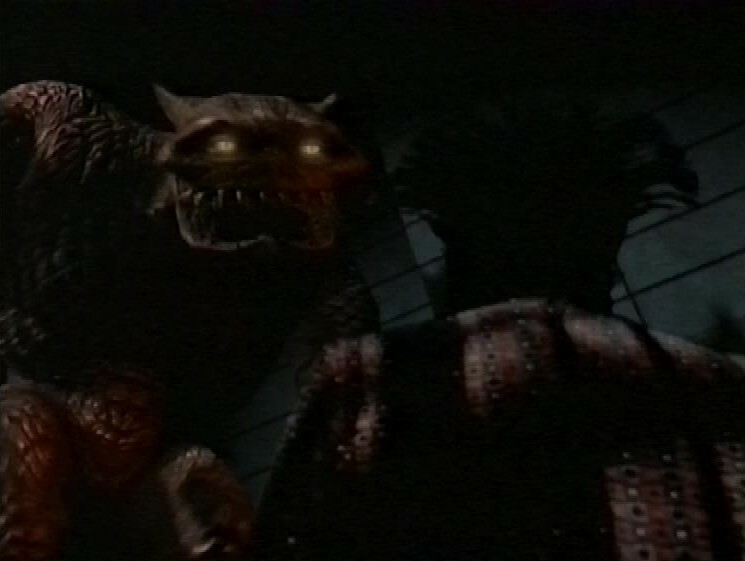 After this, there’s the start of an episode of The Hidden Room, which looks like one of the seemingly endless anthology series that abounded in the 90s. There’s a few minutes of this before the tape ends. In the adverts, there’s a McDonalds advert, featuring a young woman who looks like Amanda Abbington. Can’t be sure though.